This is a single-throttle Bell-style collective lever. It has a 200-degree throttle travel range and a 40mm diameter, just like the real one. It is specially designed for use with switchpanels (heads). Assembly is very similar to a twin collective and pretty straightforward. Will add the manual soon, meanwhile, if you have any questions, please contact me through comments. 1. 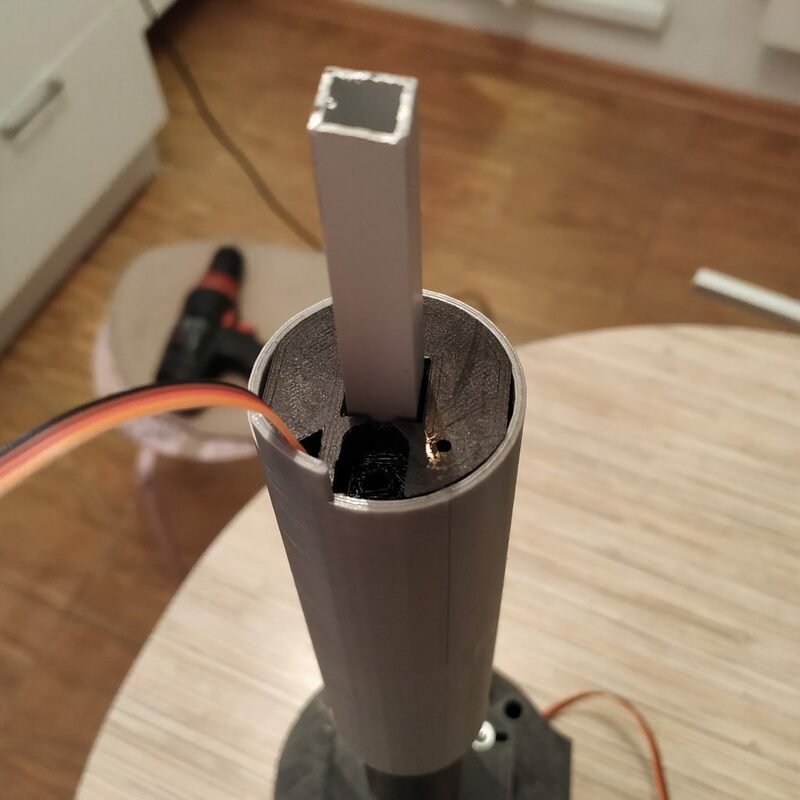 Cut a 180mm piece off a 10 square aluminum tubing. File edges of the cut. 2. Press fit an SS495A sensor to the socket and solder a 3- wire cable to it. Attach the cable to the underside of the lever frame part with hot glue. 3. 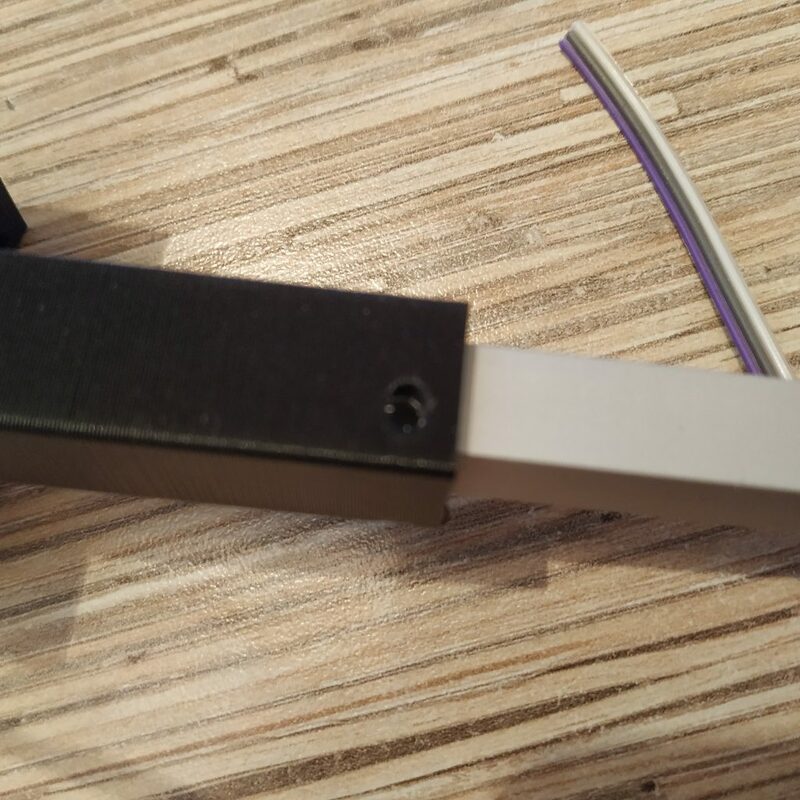 Insert the alu piece into the lever connector part. 4. Insert lever connector part into the frame, put bearings on. Insert 2 M3x35mm screws, put nyloc nuts on them. 5. 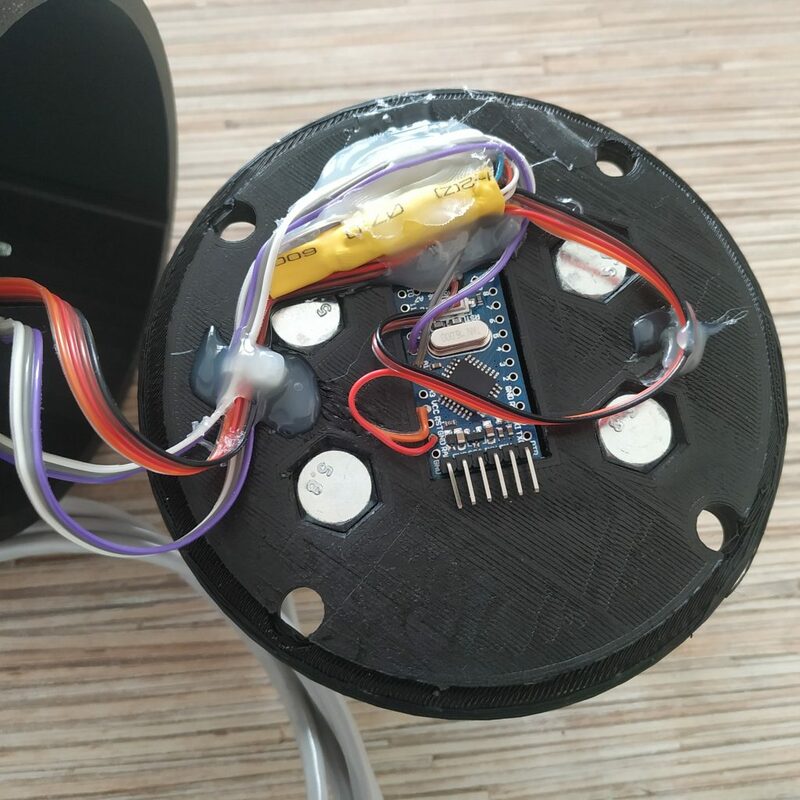 Secure the sensor in its socket with a drop of cyanoacrilate glue (superglue). 6. 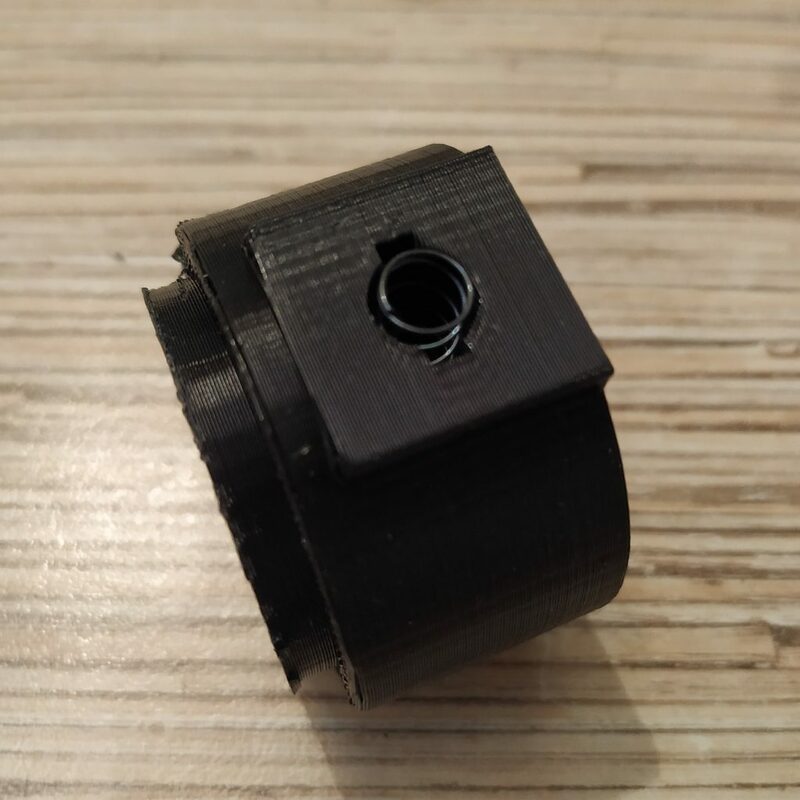 Screw an M3x40mm scre into the frame connector to remove supports from the hole. 7. Insert an M3x20 screw into the lever connector part from its right side. 8.Drill a hole in the 10mm square pipe piece through the hole in the lever connector part. 10. Insert the lever frame assembly into the housing. Fix it with 4 M3x40mm bolts. We will use the latest mod with a side window. 11. Put 4 nuts with washers onto the bolts. 12. 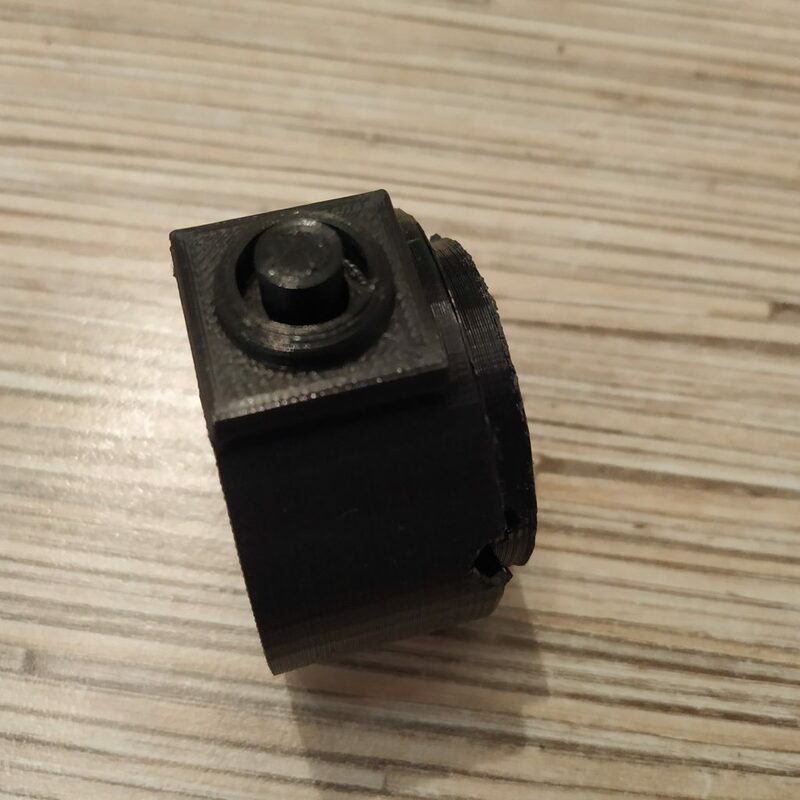 Fix the 10mm pipe in the lever connector part with an M3x20mm screw. Screw head should be on the window (left) side. 13. Put tensioner halves on. Widen holes in one of the parts with a PH0 type screwdriver and install that part on the left side of the lever (the one with the window). After that, put another part on and add 4 washers and nyloc nuts. Tighten them in a way so tensioner halves will be free to move sideways, but not forward. 14. Install 4 M3x50mm screws from the left side, put nuts on their other ends. Assembly of the base is finished! Let’s move on to the lever part. 15. Install the decorative cover onto the 10mm tubing. 16. Press-fit an M4 nut into the socket in the throttle frame part 1. 17. 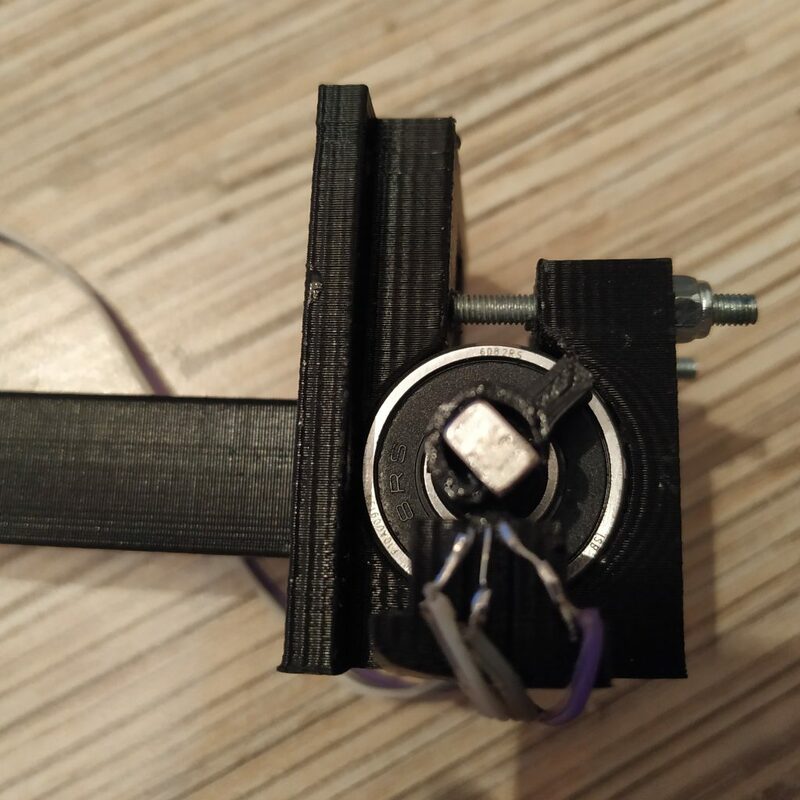 Insert a potentiometer into throttle frame p1. 18. Put the throttle frame part 1 onto the 10mm tubing. Drill holes in 10mm tubing through holes of the frame part 1. 19. Press-fit nuts into their sockets and insert 2 M3x30mm screws. 20. Route 4-wire I2C cable and 3-wire pot cable through the lever. This step may require some patience depending on wires used. 21. Solder the pot wires and route I2C cables through the cable channel in throttle frame part 1. 22. Turn the pot fully to the left, then just a notch to the right. 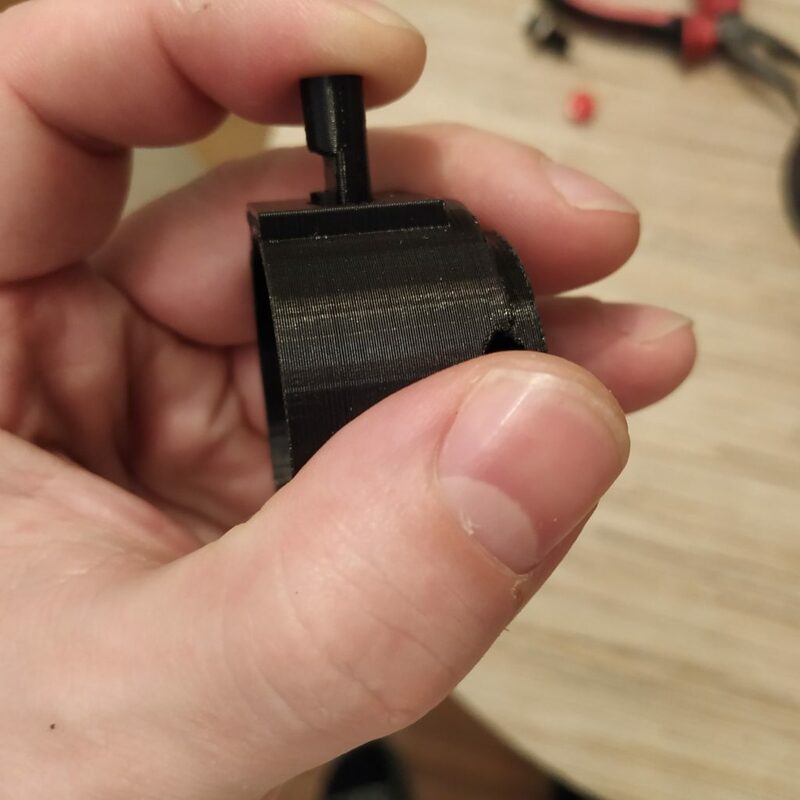 Put the throttle grip on (widen its hole or squeeze the pot knob with pliers if needed) in a way that it will be in “full open” position (see picture below). Make sure it rotates freely. 23. Cut a 105mm piece of alu tubing and file its ends. 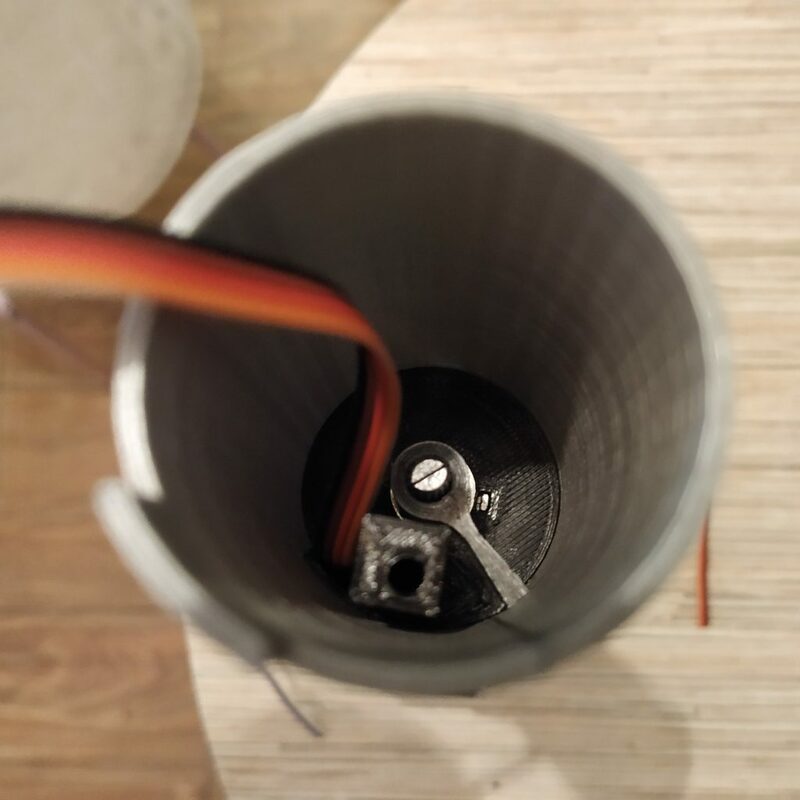 Insert the tubing piece into the throttle frame p2, drill it through its holes, press-fit nuts to sockets of throttle frame p2 and use 2 M3x30mm screws to fix the tubing piece in it. 24. Route 4-wire I2C cable through the throttle frame p2 part. Insert the part into the throttle grip, so the pin of throttle frame p1 will go into the socket in throttle pin p2. 25. 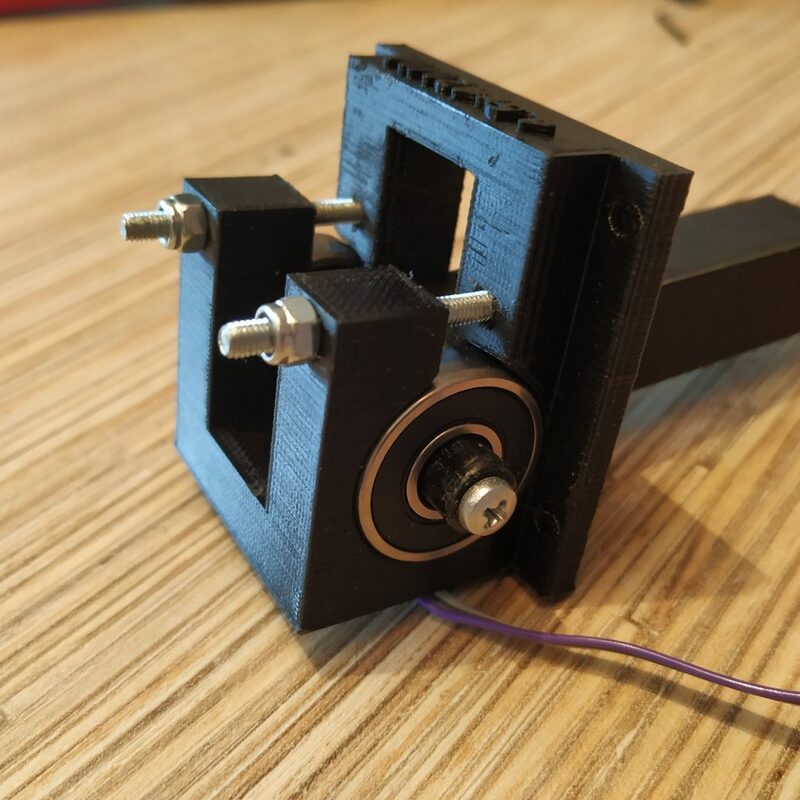 Fasten 2 parts of the throttle frame together with an M4x80mm screw. 26. 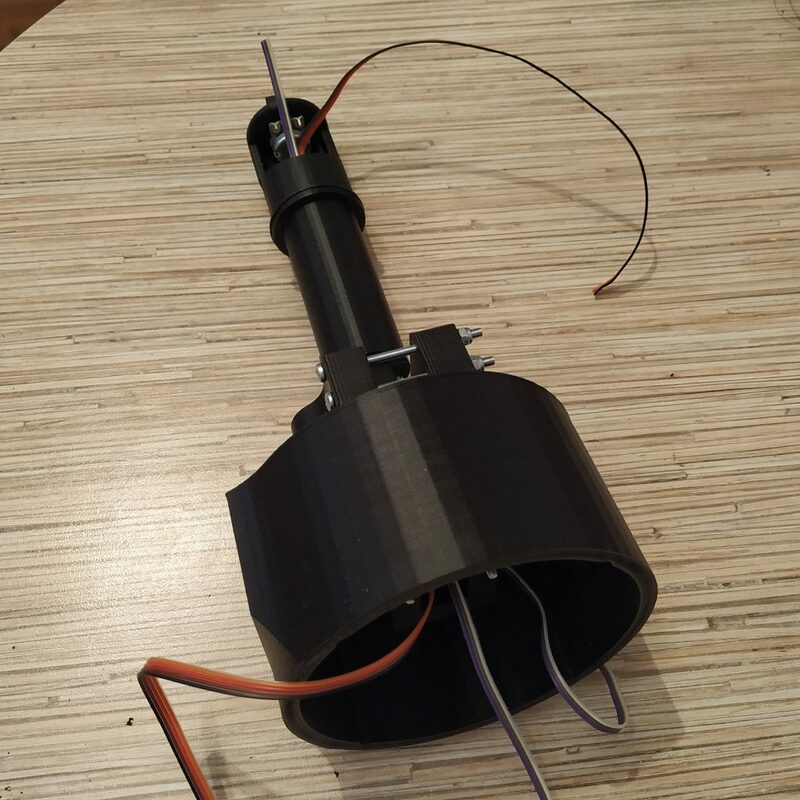 We will be using the physical throttle latch mod for this build. 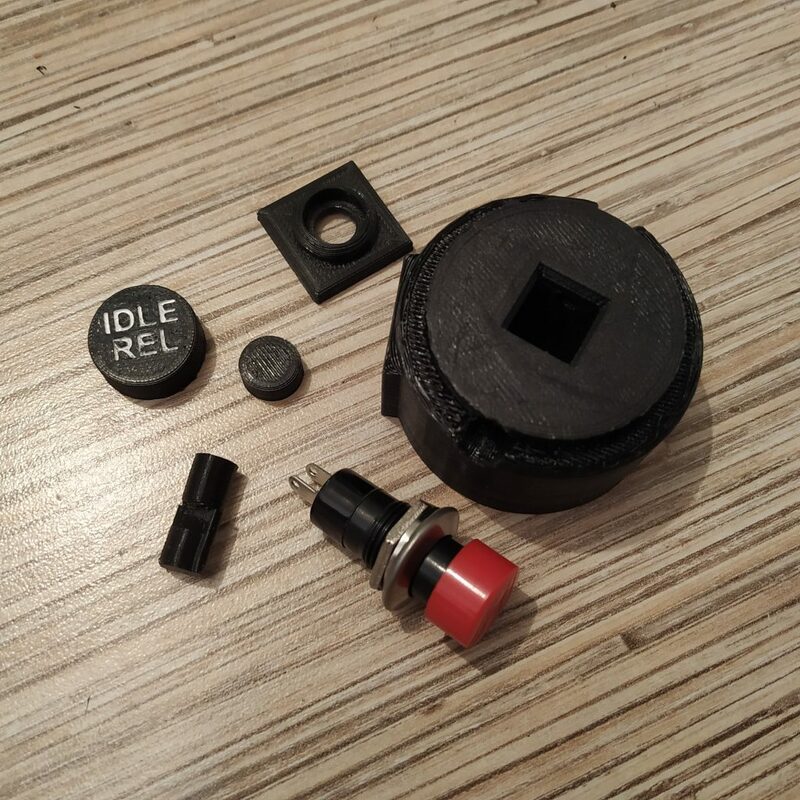 To assemble the modified I2C cable housing part, we will need a PBS-16B button, as well as printed parts from the mod folder. 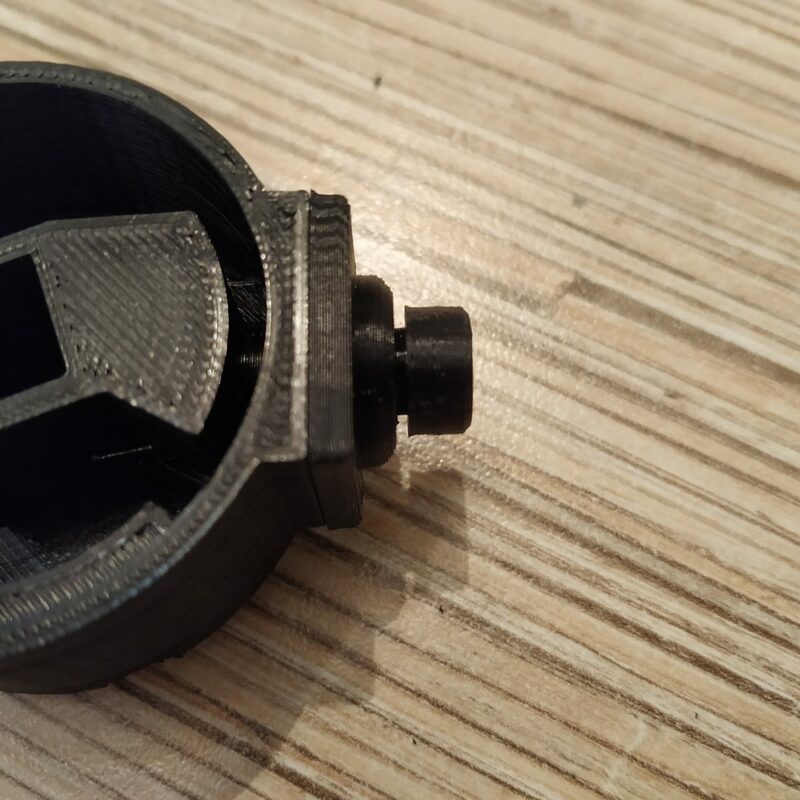 Note that the latch pin should be printed with 100% infill. 27. 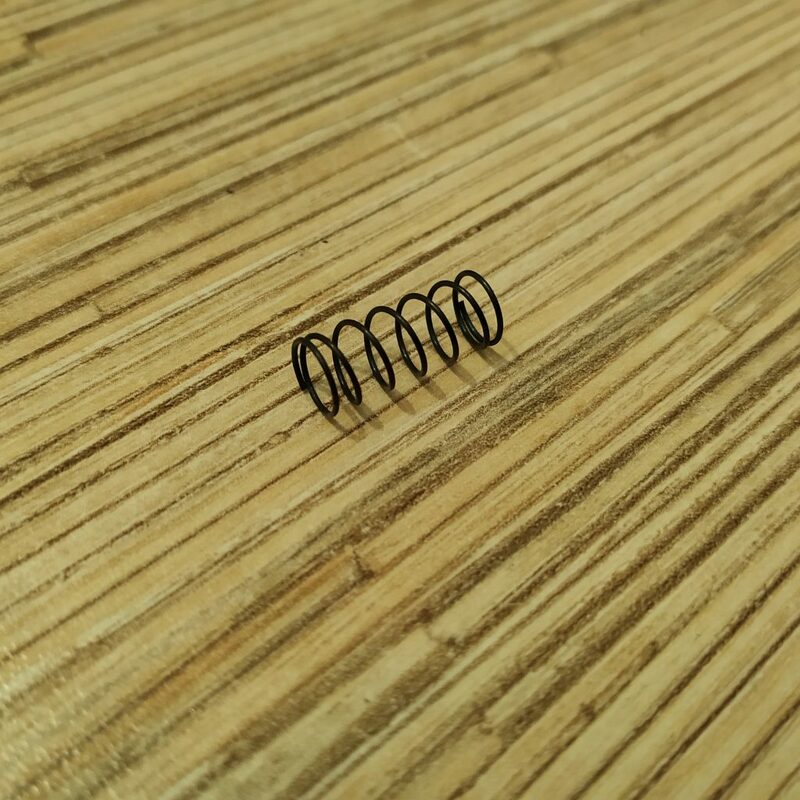 Disassemble the button and take out the spring. Put it into the throttle latch socket. 28. Insert throttle latch pin into the socket, squeezing the spring. 29. Glue the socket cover to the I2C connector housing part. 30. Glue the button top to the latch. You can choose between a small button and a scale 206-style one. 31. Solder the 4-wire I2C cable to an ethernet cable. 32. Add some hot glue to fix the ethernet cable in place. 33. 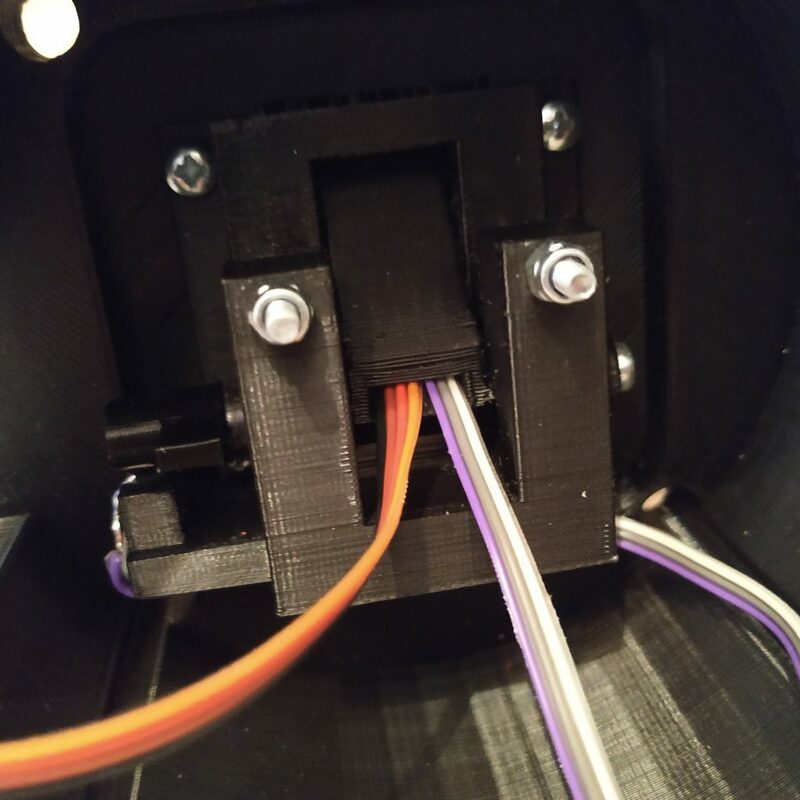 Put the I2C cable housing onto the lever. 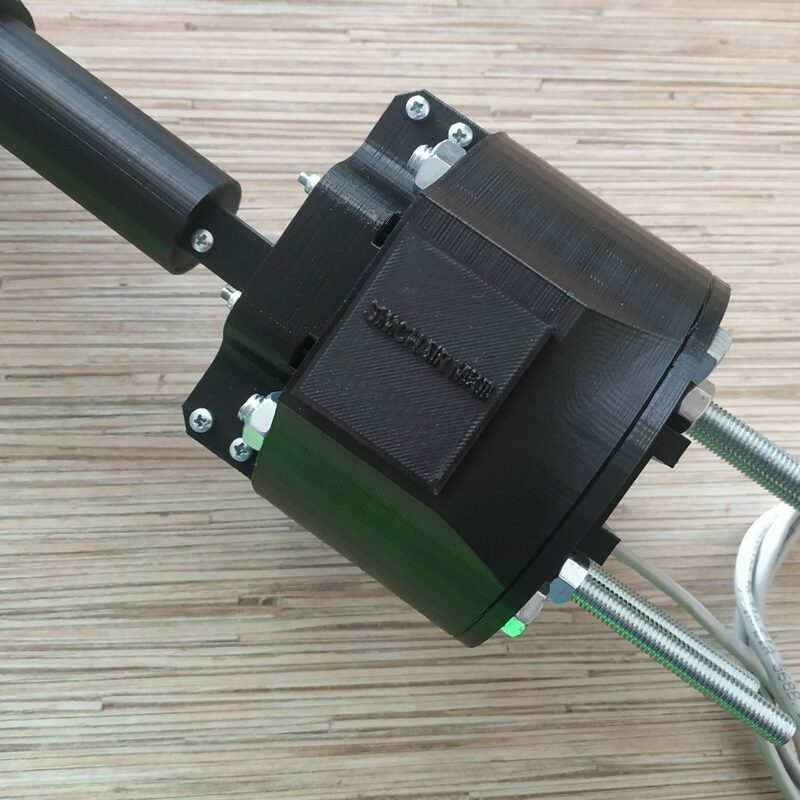 Secure with an M3x35mm screw. 35. Flash the board with single_collective.ino and calibrate the lever. 36. Now it’s a good idea to do some cable management. 37. Put the lid onto the housing and secure with 4 M8x75mm screws. 38. 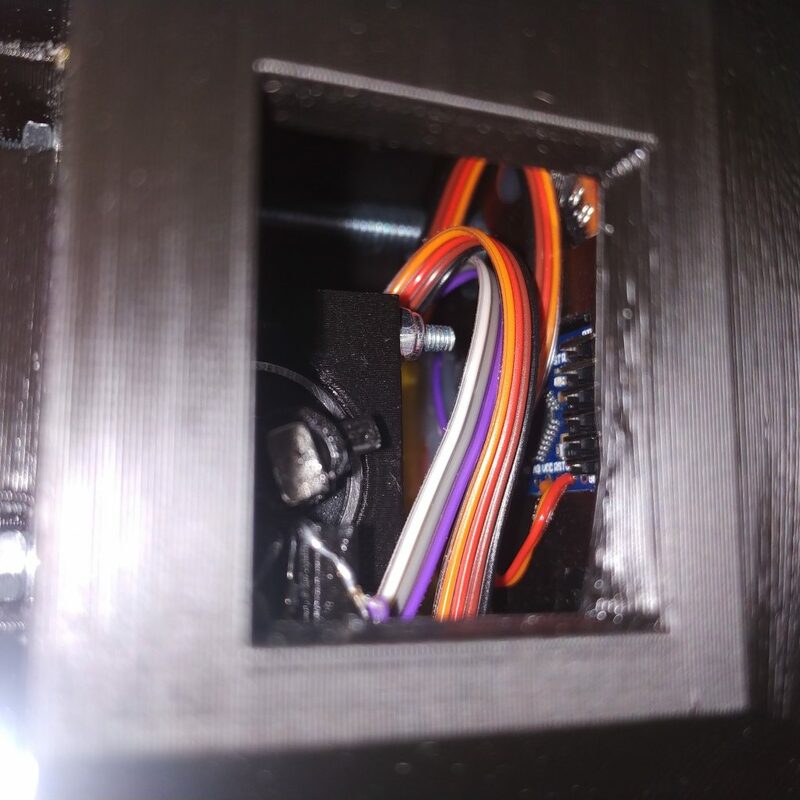 Make sure cables are fine inside of the enclosure and nothing touches the magnet, then close the hatch. 39. 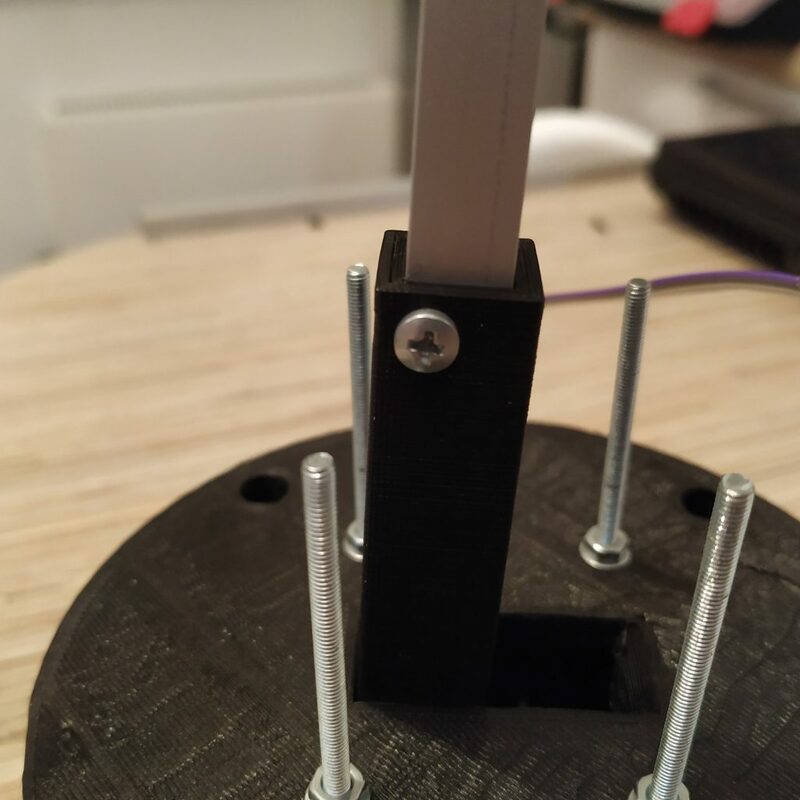 Install a head and drill holes in the square tubing where a mounting screw goes, then insert one. Congratulations, the lever is finished! Install the pneumatic mod and enjoy realistic helicopter flying experience! There’s also a very detailed build log by Peter, be sure to check it out! 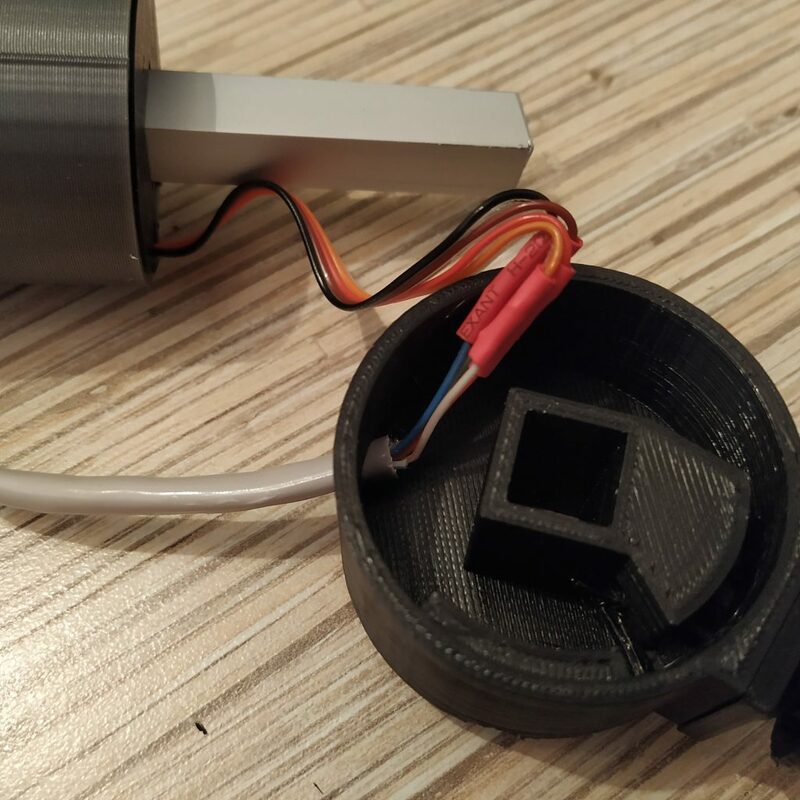 1) “Start with press-fitting an SS495A sensor into its socket.” – The sensor has a broad side and a narrow side. 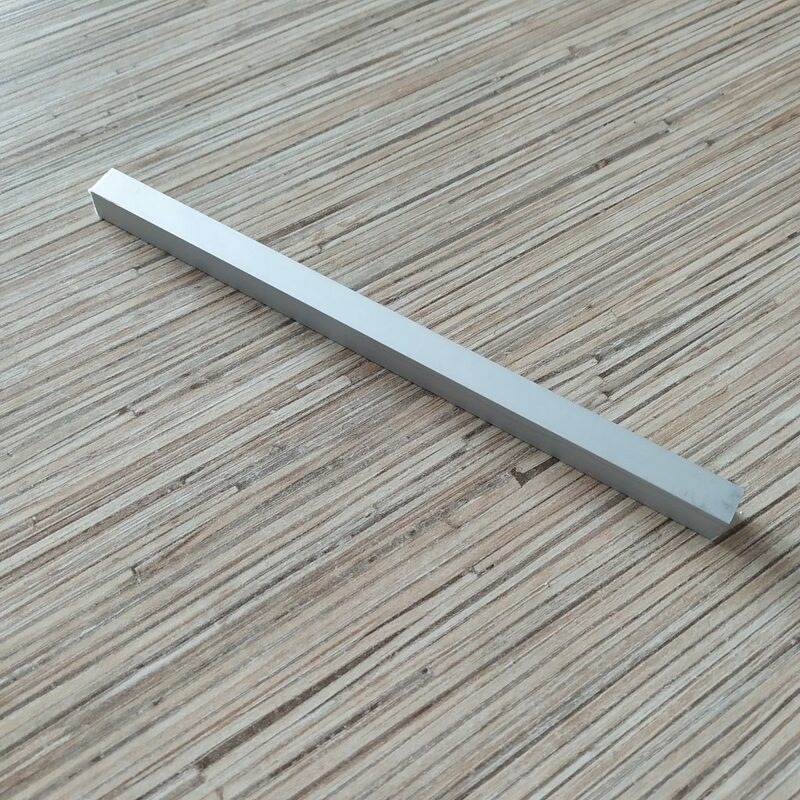 The sensor is placed horizontally, with the broad side facing downwards. Is that correct? 2) “Solder its wires and bend the legs, fix everything with drops of super glue.” – How long should the wires be – 10-15 cm? 3) According to this datasheet ( https://goo.gl/Vqv5MM ), when the broad side is facing downwards then the wires from RIGHT to LEFT should be: ground, -, +. Is that correct? 4) “Then, insert the lever connector into its frame and press-fit 608zz bearings. 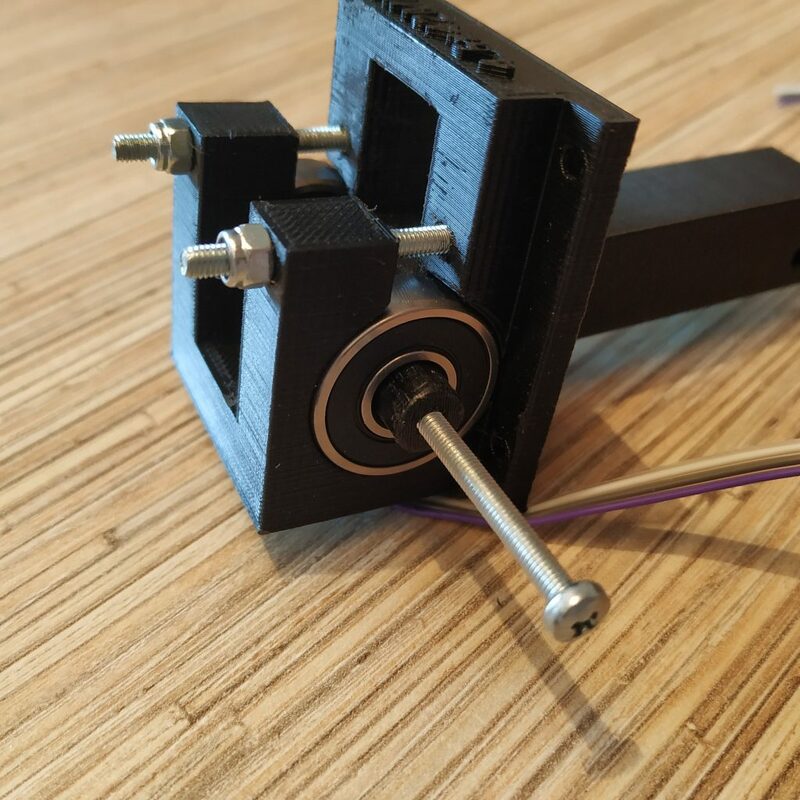 Insert M3 screws and put nuts onto it to fix bearings in place.” – So on the video you use ONLY ONE M3x45 screw which you put through both bearings, but no nuts? Then you use 2 M3x40 screws to strengthen the construction, but again no nuts? 5) “Put the magnet into its socket.” – Which socket? Is this the “magnet holder” part? But where does the magnet holder go? 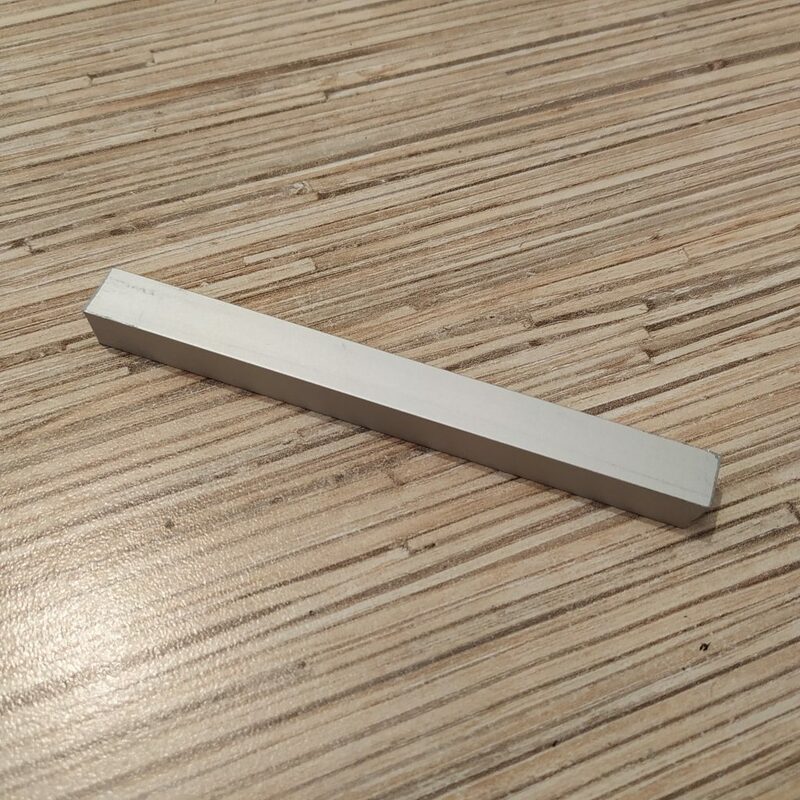 It is never mentioned, and on the video it suddenly is on the side of the SS495A… The magnet holder is also an exccentric part, and I need to know how to orient it. Thanks for your help so far! I am looking forward to continue. 2) for ss495a, yes. Other wires should be longer as they’ll go through the lever. 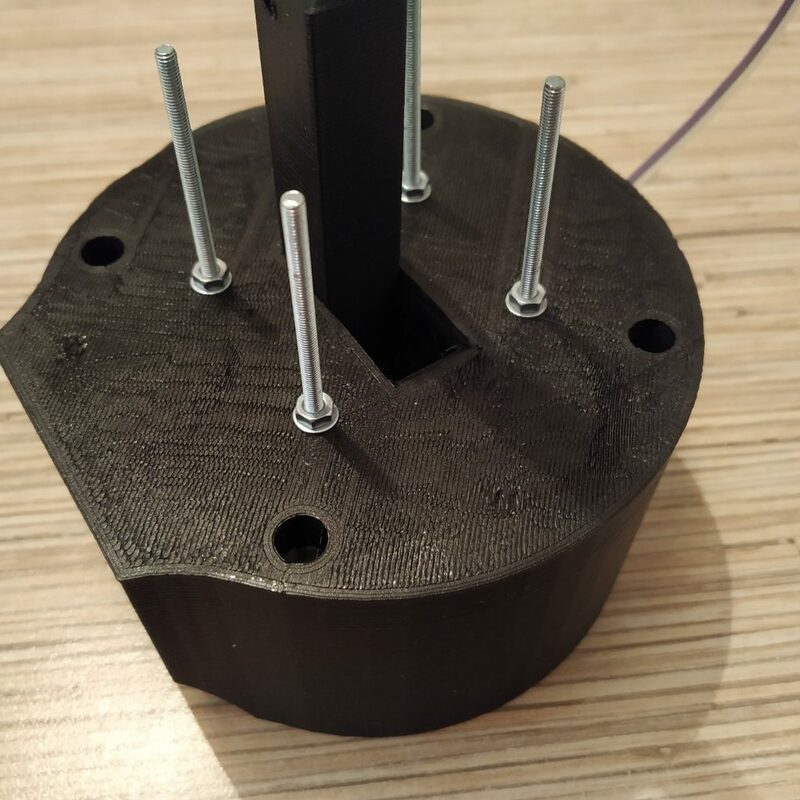 A good idea is to put printed parts on the table to get a rough estimate of needed wire lenghts. 5) magnet holder goes to the side of the lever connector, where an ss495a socket is on the frame. You fix it (do not overtighten) with one of strenghtening screws you insert to the lever connector. 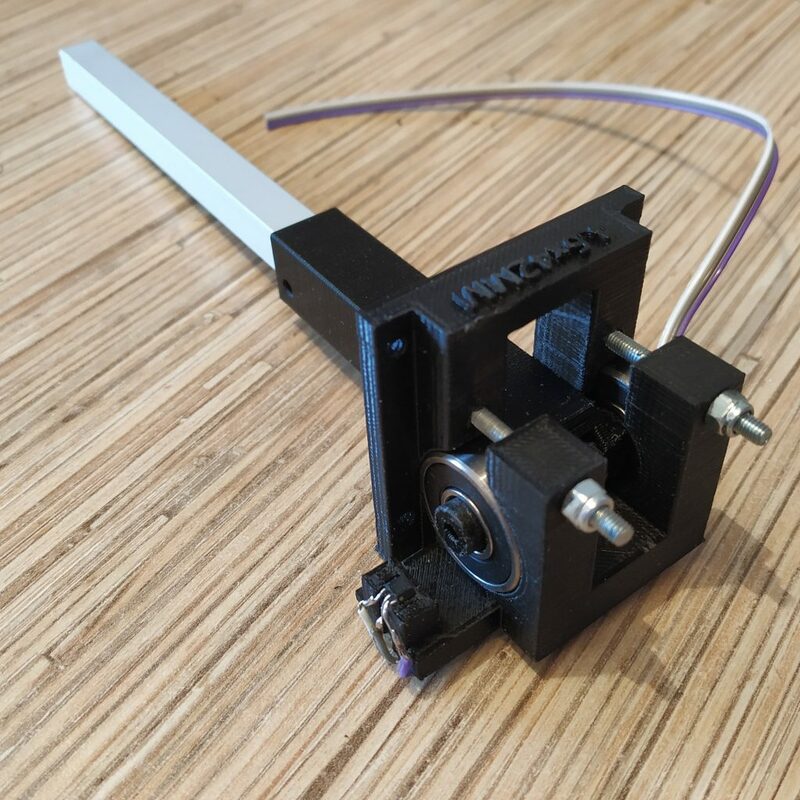 The idea is, it can rotate for mechanical calibration of the lever. You adjust screw until you can rotate it with a slight force, so it wont rotate on its own. Then you insert a magnet, it should hold itself against the screw head. 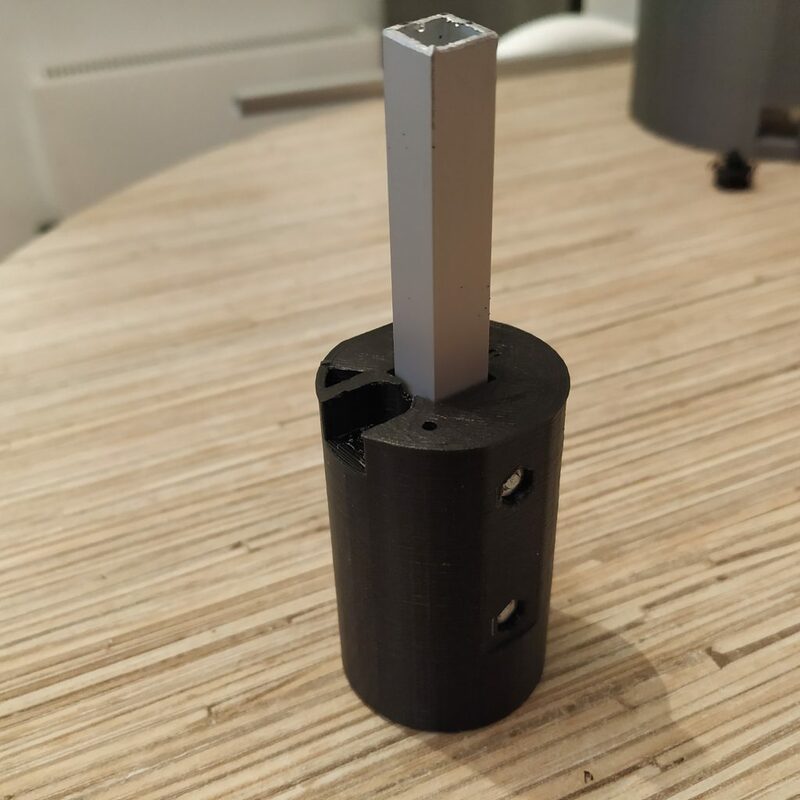 Orientation of the magnet holder: cut side towads the sensor, holder handle towards enclosure bottom lid (you turn it by holding this handle with pliers during calibration), choose default rotation angle so that when the lever is roughly in the middle of its travel, the magnet is above the middle of a sensor. Thank you for copying my comments and enabling posting on this page! As you can see, i had to modify the socket for the sensor little bit, because my SS495a is a little too big. I would also suggest making the “slot” on the side (where the legs of the chip go) a little more trapezoid for easier routing. 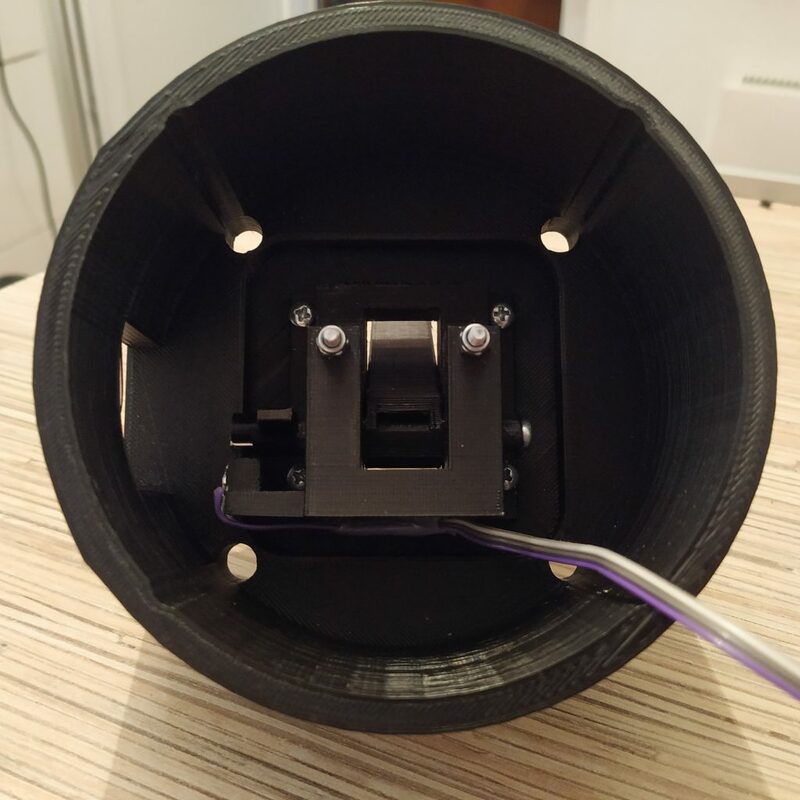 Also I would suggest increasing the size of the hole for the horizontal M3 screws (which fix the bearings in the gimbal) because I had to file the holes until the screw-heads were able to penetrate enough to be flush with the surface. I will try to continue withe the build and post more comments and questions as I got long. Thanks for everything! Everything looks good! A little warped though. 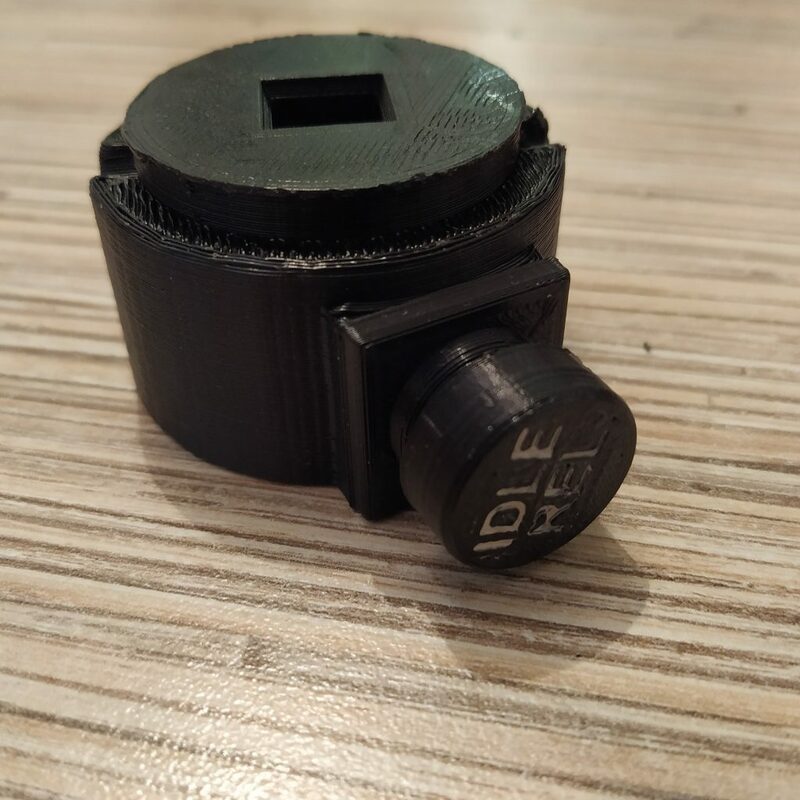 What are the print settings your friend uses? Looks like either it’s not PLA or not enough layer cooling. 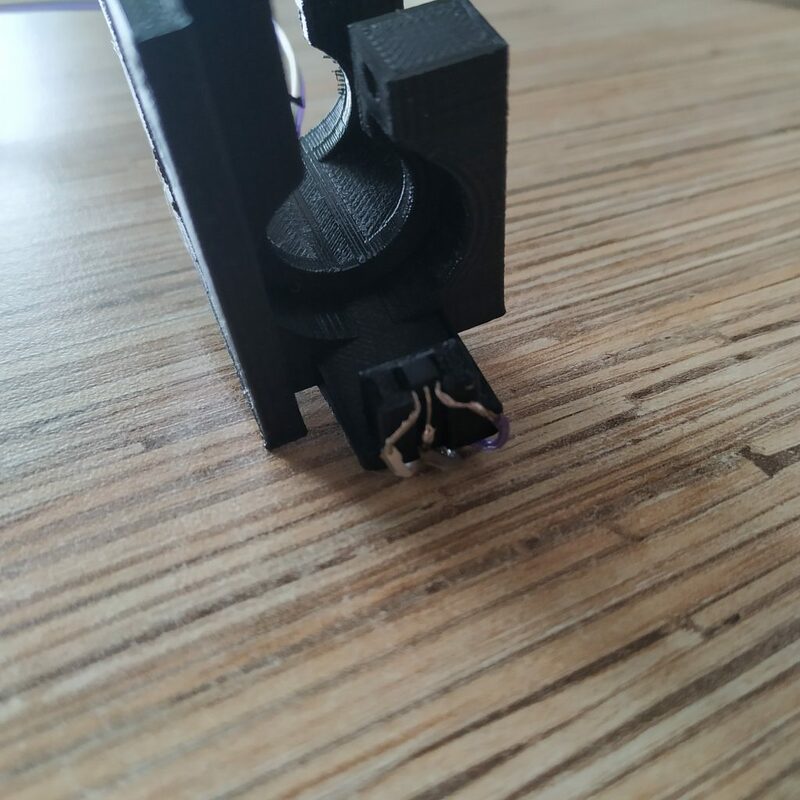 If printed in other plastic or without proper cooling, parts will shrink and all holes, sockets etc will be smaller than they should. 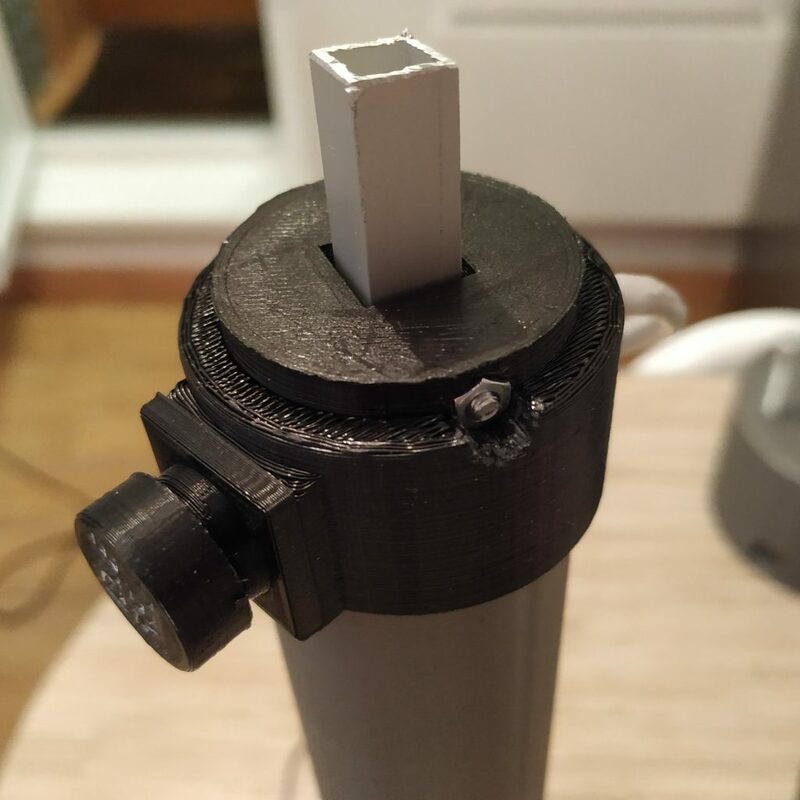 This is bad, because building the rest of the lever (where you need to put stuff onto the aluminum pipe) may become a pain =) You can try using a plastic part printed with the same settings instead of an alu pipe in this case. Still, I don’t recommend printing it in ABS, as all the tolerances and clearances are chosen with PLA in mind. 1) I am confused on how long should the aluminium pipe which goes into the “single collective lever” part be? On the video at around 15:00 you show the pipe, but the length it not mentioned. On the “simple collective” page the length is given as 25cm. And when I imported your models (.sldasm and sldprt) into Autodesk online viewer, the length of the pipe came out as around 17cm. 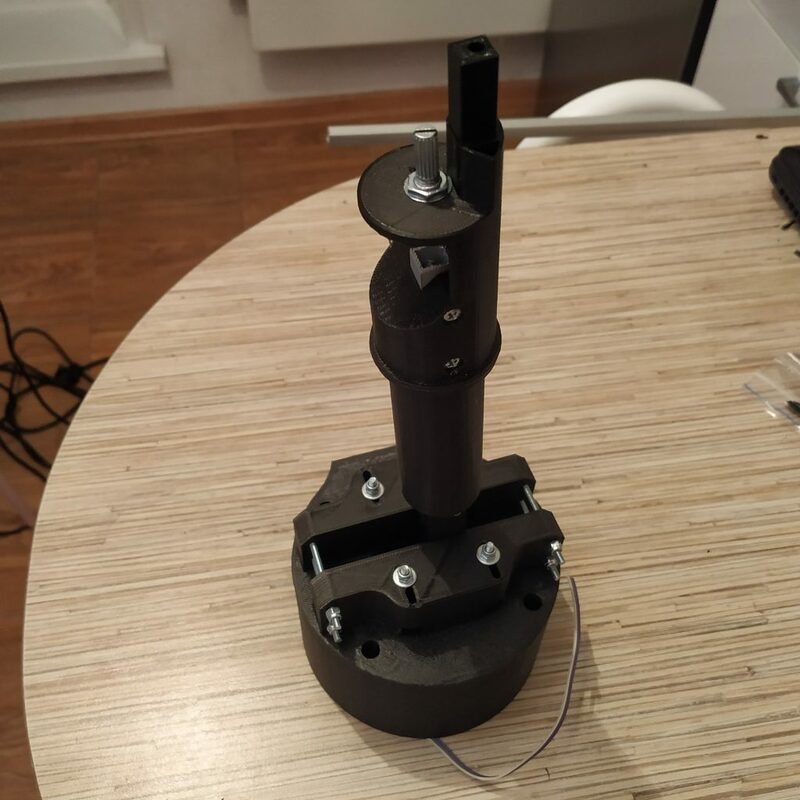 2) Speaking of alu pipes: I guess that I will need more pipe to connect the head with the parts “single collective thottle frame p2” and “single_collective_head_i2c_connector_housing”. How long should that one be? 3) About cable routing: If I understand your explanations in the video correctely, I will have to deal with the routing of 2 cables: 1x from the potentiometer inside the ”	single_collective_throttle_frame_p1″-part and 1x with the ethernet cable coming from the bottom of the AB412 head part. My question is: How do I route the ethernet cable invisibly through the alu pipes? I can’t see a proper way. By the way: Uploading the .sldasm files was a great help in figuring this out in 3 dimensions!!! Thanks again for your help! I love this project! 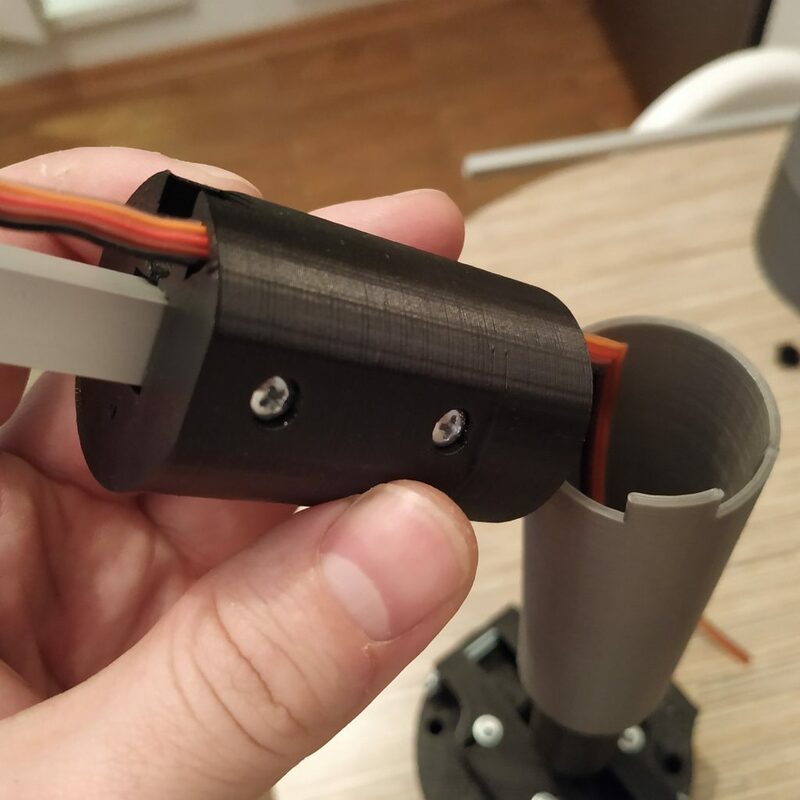 About the length of the pipe: just put printed pieces next to each other (to see how they will look when assembled) and cut the pipe so it would not protrude too far out of its sockets when everything is assembled. It can protrude a bit, but should not do it much. 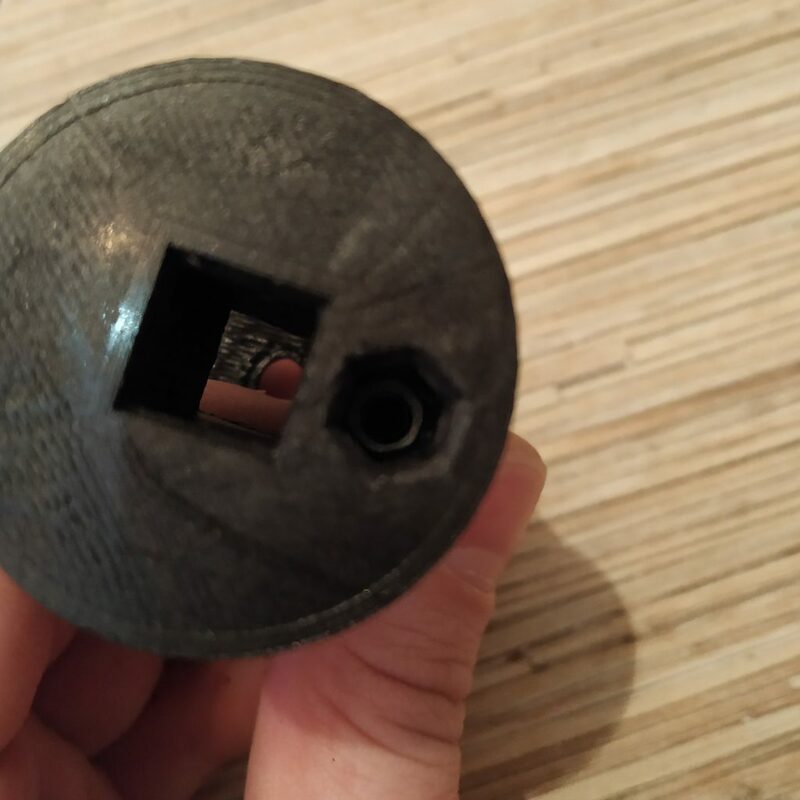 It’s best to press-fit the pipe into the lever connector before inserting it into the lever frame (it should be pressed until it touches the end of its socket, but if it will be too tight, press it as far as you can, just don’t drop the lever in this case, as lever connector may break). Do not forget to insert all of the screws, try to tighten stuff together to reduce backlash. After throttle 1 frame part, the I2C wire goes through a triangle-shaped cable channel up to its decorative cover, where it is soldered to the ethernet cable again. 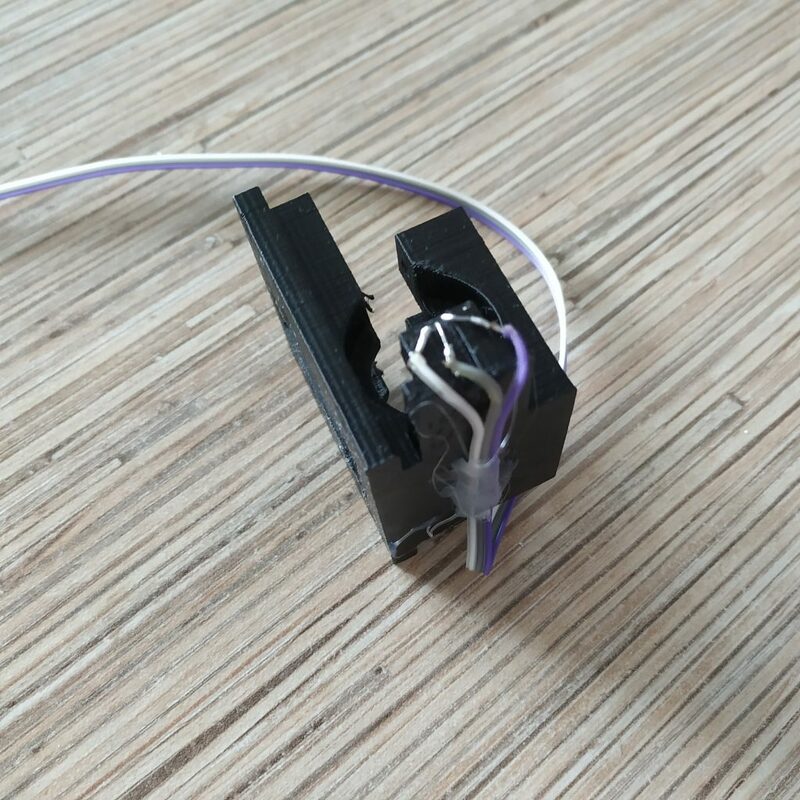 Use hot glue to secure ethernet cables in corresponding parts. 1) About the head/cable part: I think I can picture it in my head now. But seeing a picture of the underside of the head/collective connection would be helpful! 2) Ethernet/IC2 cable connection. As I picture it in my head, you just use a short few cm worth of ethernet cable between the socket in the AB412-head and the collective level decorative cover. Wouldn’t it be a little more “elegant” to use a longer ethernet cable and just strip the isolation from the whole cable, except for the “top” part which is between AB412-head and decorative cover/triangular cable channel? And just cut the 4 wires I don’t need? 2) You will like that ribbon cable as soon as you will get your hands on it =) Trust me, having a lot of single wire cables in a tight space (when you do scale metal stuff in plastic, space is always tight) isn’t what you want, really, but you probably have to try it to understand what I mean =) That ribbon cable just makes cable management easier, bends well when needed, is cheap and compact. Hello again, Alex! Thanks for your suggestions! 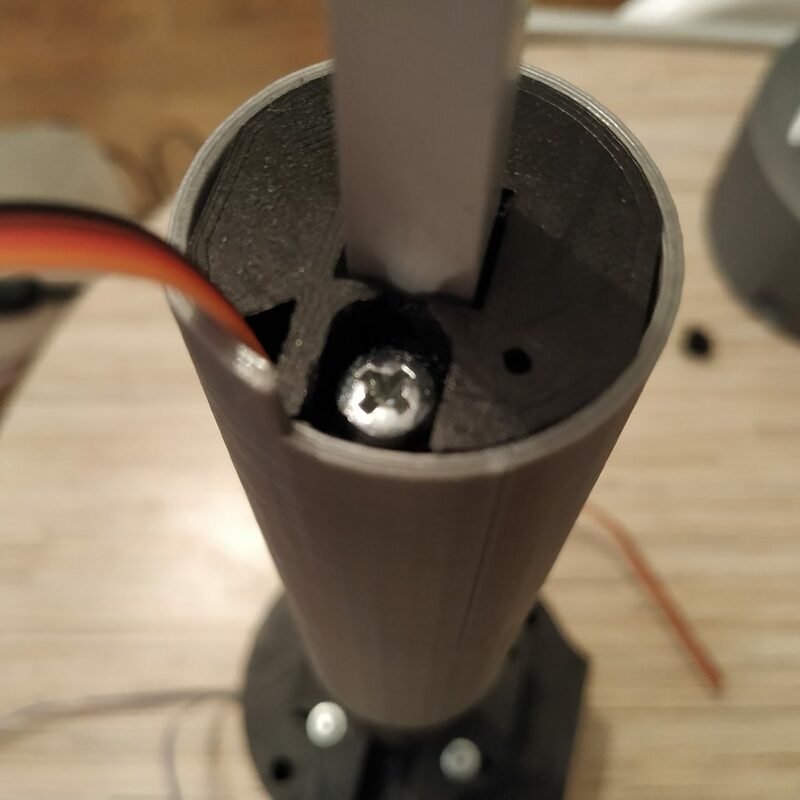 I ran into some problems while assembling the alu pipe and screws (imprecise drilling, some broken thread…. have to dremel the screws *facepalm* but it’s absolutely permanently fixed now! *lol* ). The picture is very helpful! And after experimentally tinkering around with the parts and some spare wires I totally get what you said about it being easier with ribbon cable! Would you mind posting another picture? I would love to see the “underside” of the completed AB412head connected to the throttle – I need to see the cable routing. As always: Thanks for your suggestions! This is the most fun tinkering project I did so far! Or do you mean how the ethernet cable enters the head? There’s a TJ8-8P8 socket pressed fit into the corresponding slot in the head. Hey, those are great pictures! Now that part is also clear to me, thanks! I’ll try my best to describe: The throttle grip has a little long tube inside. On one end that tube slides over the potentiometer “pin”, the other end goes into the “throttle_frame_p2”-part until the “upper end”. Now if I insert the alu pipe into the “throttle_frame_p2”, there is not enough room inside to also fit the little tube into there. 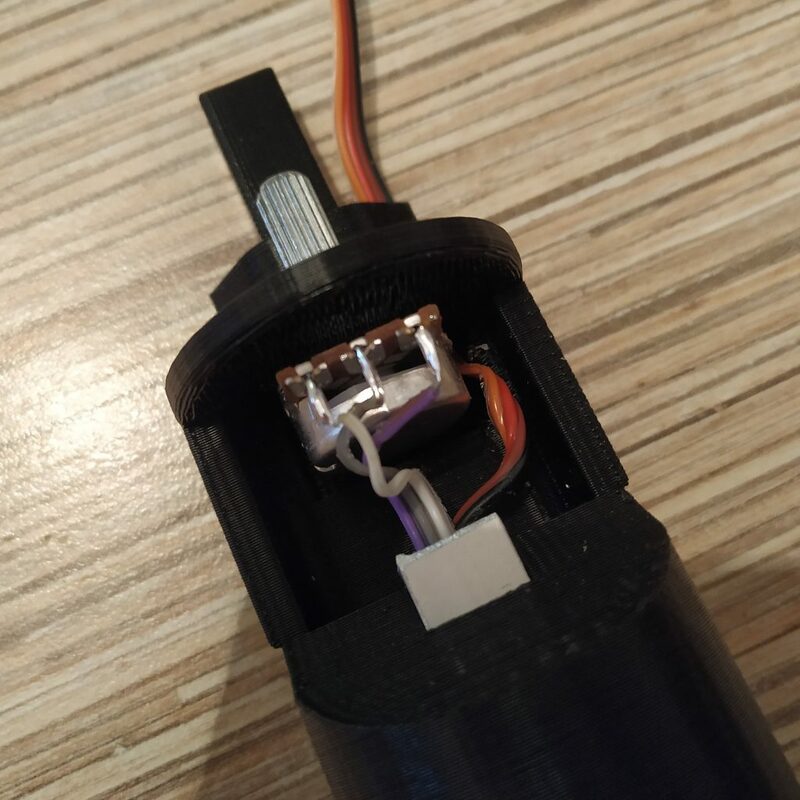 It’s also impossible to fix the alu pipe inside the “throttle_frame_p2” because the screws will go right through the little tube. I tried your suggestions and it worked! After resoldering the pot cables, I filed the inner tube so it would fit very tightly over the potentiometer “pin”. Then I threaded the cables as you showed in the video, and put everything together. 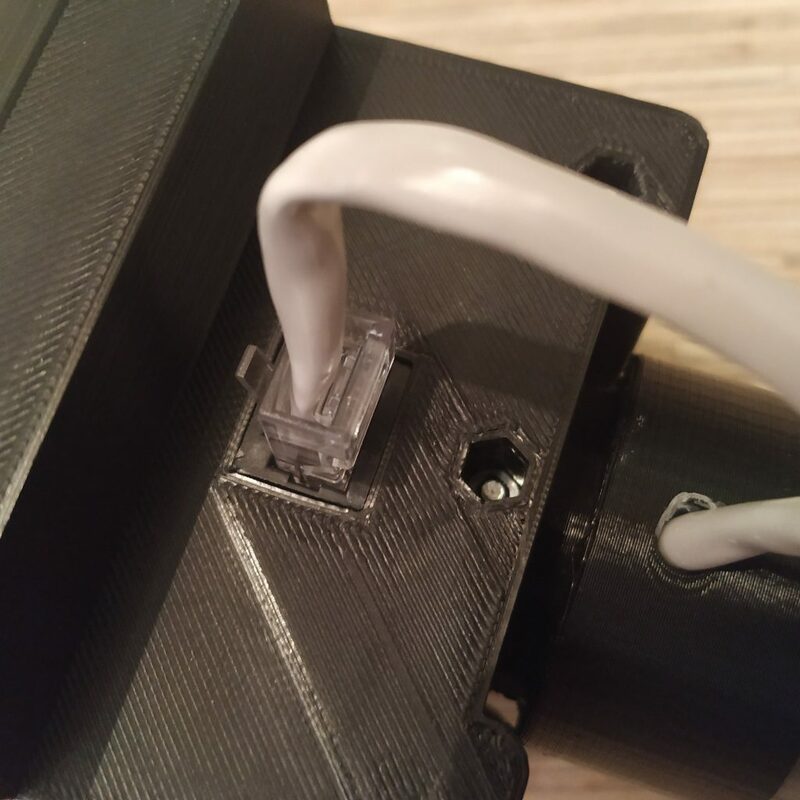 Luckily the screw which goes through the “lever_connector”-part was the only one I didn’t ruin! So it was no problem to remove the rubber bands holder and put in the M4-nut. I used the inner tube to push into the potentiometer pin, then I simply broke it off. You were right: It was easy to remove! Against your advice, I wanted to try it with a stripped ethernet cable. I managed to thread the wires through without problems. Now for the electronics part. I will have to contact you with questions regarding that. Until then: Thanks and all the best! One bad thing about ethernet cable, it can break if you bend it too much. Let’s hope everything will be fine (anyway, it’s easy to replace if something goes wrong). I hope that you are right! About the electronics part: Would you mind taking a look at my gallery (last picture) or this direct link -> https://imgur.com/2pwE8G0 . Because I tried parsing your instructions and coming up with the correct wiring scheme. Would you mind telling me if I understand it correctely and that is the proper wiring? Or if I am planning it wrongly? – colors in the ethernet wire that are used are white-orange (5V), orange (GND), white-green (SCL), green (SDA), in that particular order from left to right while holding the cable with wire looking at you, contacts facing up (look at your ethernet cable). Why? It’s your standard ethernet cable crimping scheme (EIA-568B standard), it provides an additional reference for you to avoid making an error in the wiring. Also, you can use an ordinary ethernet cable for connecting stuff. Note that you may need to press the reset button on Arduino pro mini when it says “waiting for a programmer to respond” or something like that to flash it. 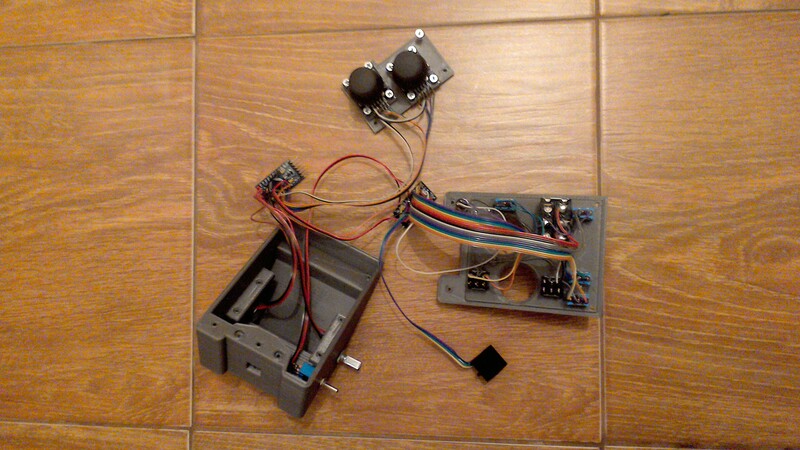 Also, note that the head has 2 arduinos in it. Now you say that it is the other way round. Actually I don’t mind, but I just want to make sure that there is no misunderstanding. 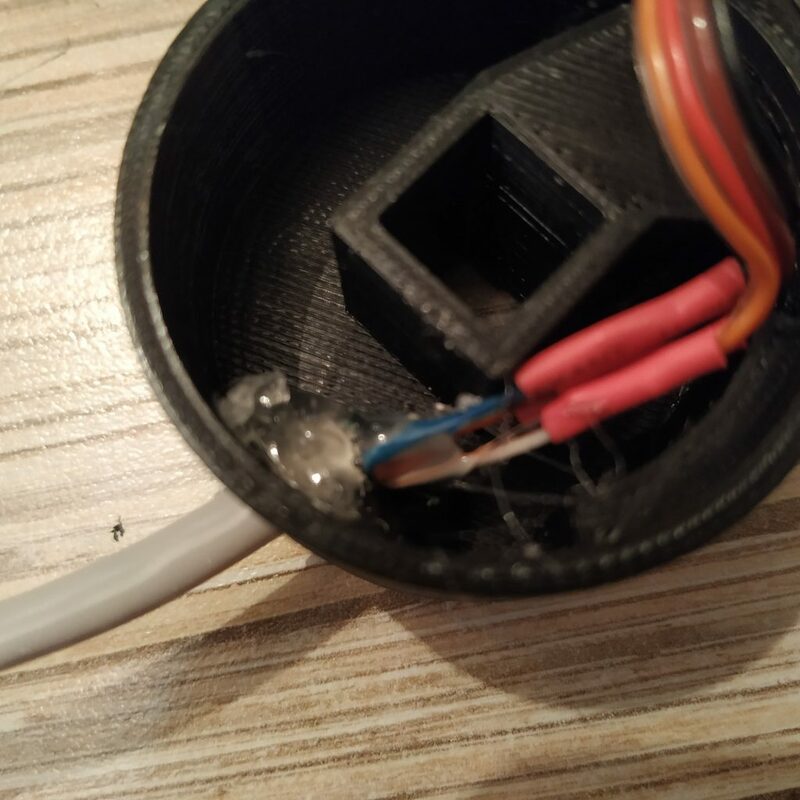 One last question: What is the reason for you choosing to route the connecting ethernet cable through a hole in the base of the collective? I am pondering putting there another RJ45 connector to make it more modular. I see your point! 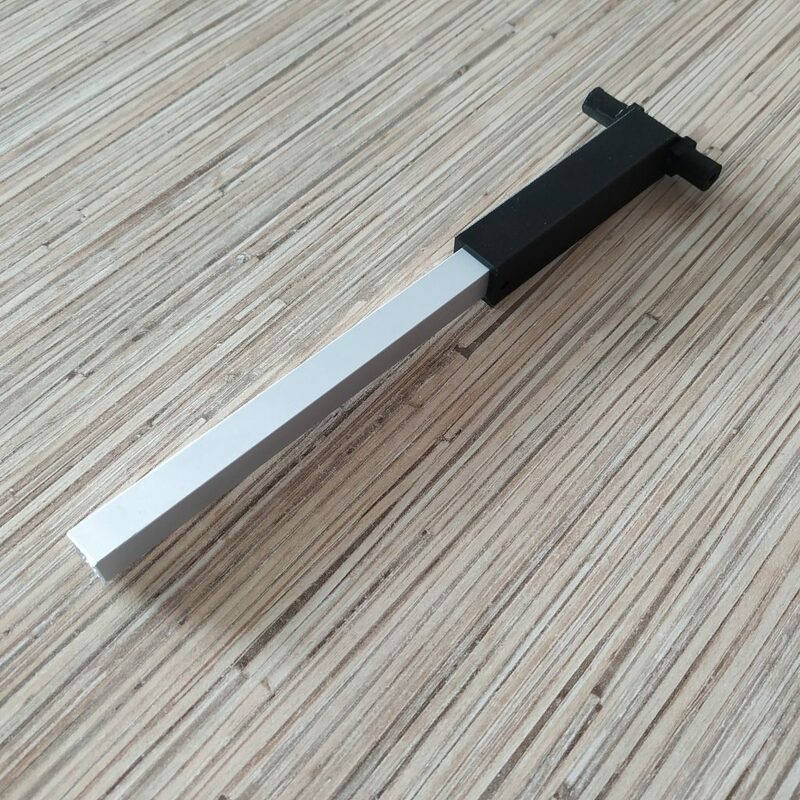 However I bought those parts in bulk at Aliexpress so I have a few spare ones lying around. No need to make a mod though, my trusty file and me will modify the existing opening. Had to file most other parts for hours already, so I am quite confident that I will fix that in no time! Shouldn’t SDA be “blue”? At least according to all the other pages. Yup, this one looks good! Note that you can also power the pot and SS495A from VCC pin, whatever you like more. Thanks for finding errors, will fix them! 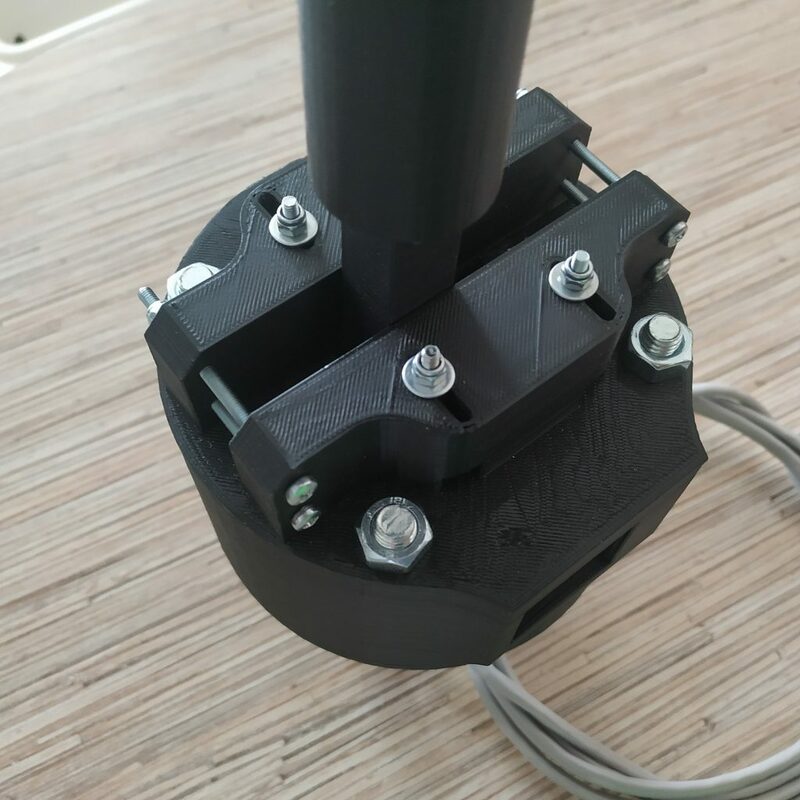 1) When calibrating, where should the little “arm” of the “magnet_holder_5x5mm_socket_single_collective7a”-part facing? 2) After much fiddling and flashing the pro mini about 20 times I manage to get a range of about 205 to 1170 on the collective. Is that correct? 3) The map function does not seem to work properly. Even when using the syntax “z = map(z,205,1170,1023,0);” and checking in joy.cpl while moving the collective through the full range the displayed movement range is about 30% to 100%. What am I doing wrong? 4) The throttle worked once with a range of maybe 23 to 350 but after flashing it now moves from around 70 downwards through zero to 63650. It seems obvious to me that this can’t be mapped properly, and when testing in joy.cpl the throttle does not react to inputs. I am fairly confident that I soldered everything properly this time and that there are no cross currents. But I will have to check again. Hi! No worries, we’ll fix it. 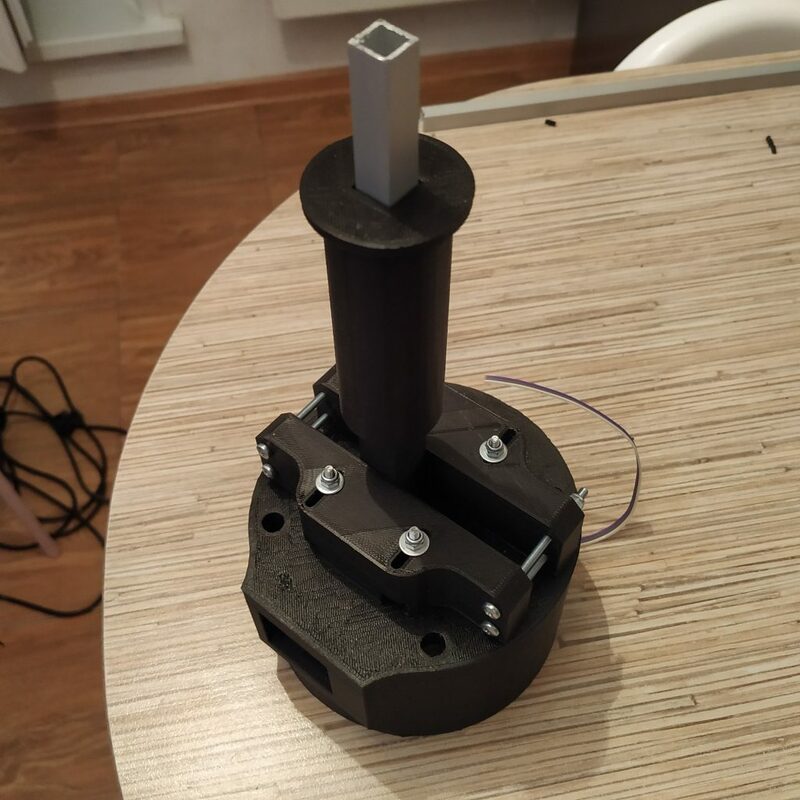 1) The little arm should point towards the rear end of the lever (you can turn the magnet holder with it), the open part of the holder should face the magnet. I did the same to the throttle but that part is not working completely: The raw range is 860 to 993. Seems a little small to me… I still inserted those values into the map function: map(rz,860,993,1023,0). However, in joy.cpl the throttle movement seems to me kind of like an exponential curve??? For 1 quarter of the travel there is no reaction at all then for 2/4 the raise is slow and in the last 1/4 the raise is very fast. Weird. I’d appreciate your input on this. I also wanted to kindly ask you for a mod to the chair attachment – where should I post about this? I tried to do it myself but I am more of a musician/hands-on guy and getting my head around Fusion360 will take way too long. Hmm, are you sure the pot is wired correctly? The middle pin is usually the signal one. Looks like you may have connected it like an SS495A =) The raw range should be something like 0 – 800 (200 deg of 300 available). The resistor should be of type B (linear, they usually have it written as B10K or B5K or A10K on them), but it will have somewhat the same range anyway. A means exponential voltage output. You may be right…. I looked at a few websites explaining how to wire a pot and and it it possible that I somehow mixed up VCC and signal wires during soldering. Oh man, I am terrible at this. Will have to check it out. One more thing: In joy.cpl I have 3 “Arduino Leonardo” devices. Is it possible to give them individual names like “Simchair MK2 Collective” and “SimChair MK2 AB412 head”? About the mod: I think that I could attach the collective onto my chair with a slightly modified “ikea_gunde_frame_collective_frame_mount_left_150_deg_ikea_gunde_frame02” and “ikea_gunde_frame_collective_frame_mount_right_150_deg_ikea_gunde_frame03″ part together with 2x”ikea_gunde_frame_frame_mount_back_part_ikea_gunde_frame04”. However I would need the first two to be not angled but instead vertical. Flying is a blast and who needs a throttle if you can adjust rotor blade angle! Thanks for your help! But these joysticks are placed in a persistent order, all axes and a stick are on the 1st one, heads are on the 3rd one, the second one is for some special stuff. Will try to do it as soon as possible when time permits. Thank you! This is a long term project for me and I don’t mind waiting. Am very glad that you are willing to do this after all. So, I finally had a little time to myself and I flipped+resoldered the VCC and Signal wires on the potentiometer. And suddenly it is working perfectely! I could calibrate it and the axes work in joy.cpl like they are supposed to! YESSSSSSSSSSS! I made something that actually works! I could not have done it without your help. Thank you SO MUCH! Next thing I’ll start is the AB412 head and an extension for my Saitek X56. So you will hear from me soon on the AB412 page. 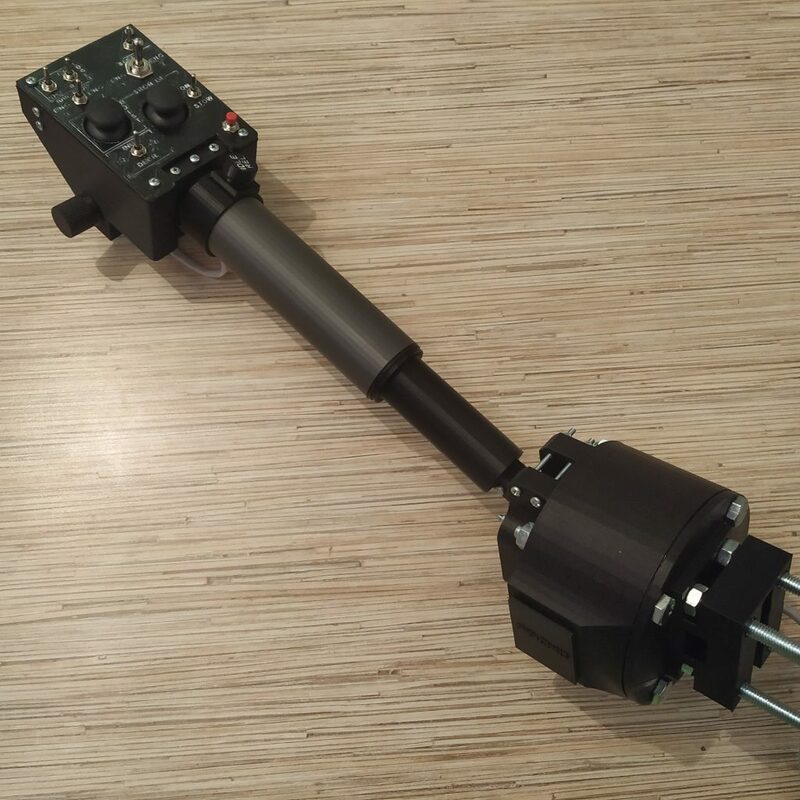 I will be working on a spherical bearing based cyclic gimbal soon, I think it may be a lot better than Saitek one (the idea is to make a gimbal that will support springs and force applications). Also, I am testing quite an interesting rubber-bands removal related mod for the lever =) If nothing breaks under load in a while, I will post it, flying with it feels great. WOW! I am super impressed with this system you’ve created! I’m going to start building it and am going to have to learn a LOT on the way, but I’m very excited! 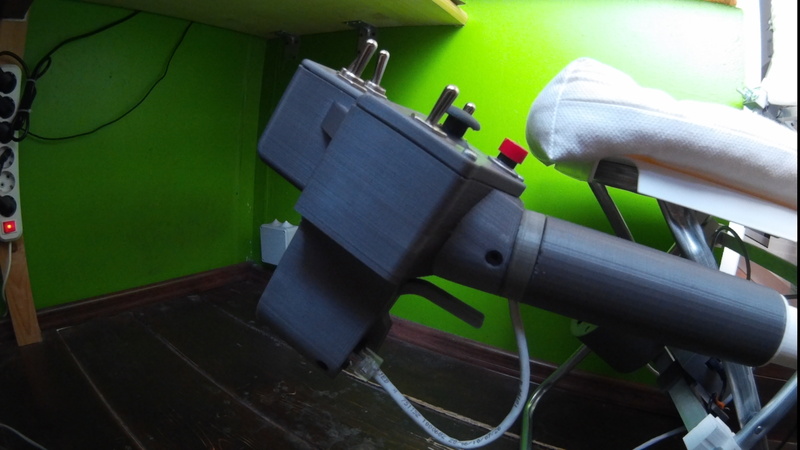 Just curious, on your thingiverse it says you’re an engineer, what type are you? Check out a new pneumatic mod for the collective, it feels great! Now I will move onto the head part. Thank you so much for all the help! Everything looks great! 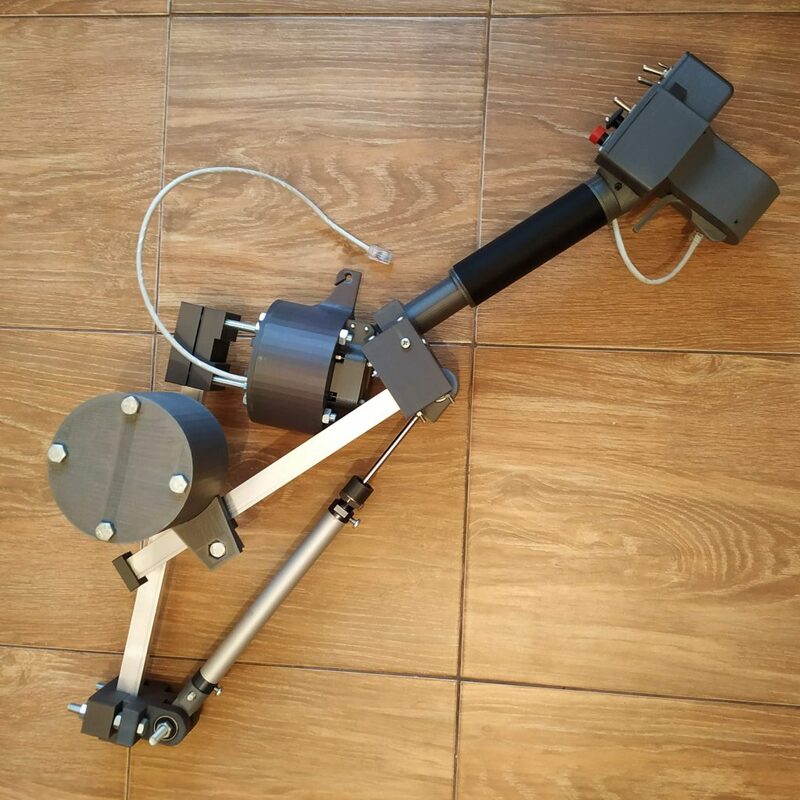 Will adjust that mount (it may be that bolts in different countries can have slightly different secondary parameters like head height). I strongly advise you to try the pneumatic mod- can’t really imagine flying without it anymore =) I have to say that, with or without the cylinder, a counterweight works better than rubber bands. I am now working on adding proper photos to every manual, hopefully, will add photos for the 412 head and a pneumatic mod in a few days. That’s great! Feel free to use any of my photos and modify them in any way you deem useful. I would love it if I could provide something useful. First and foremost, thank you for taking the time and effort to host all of this to us. 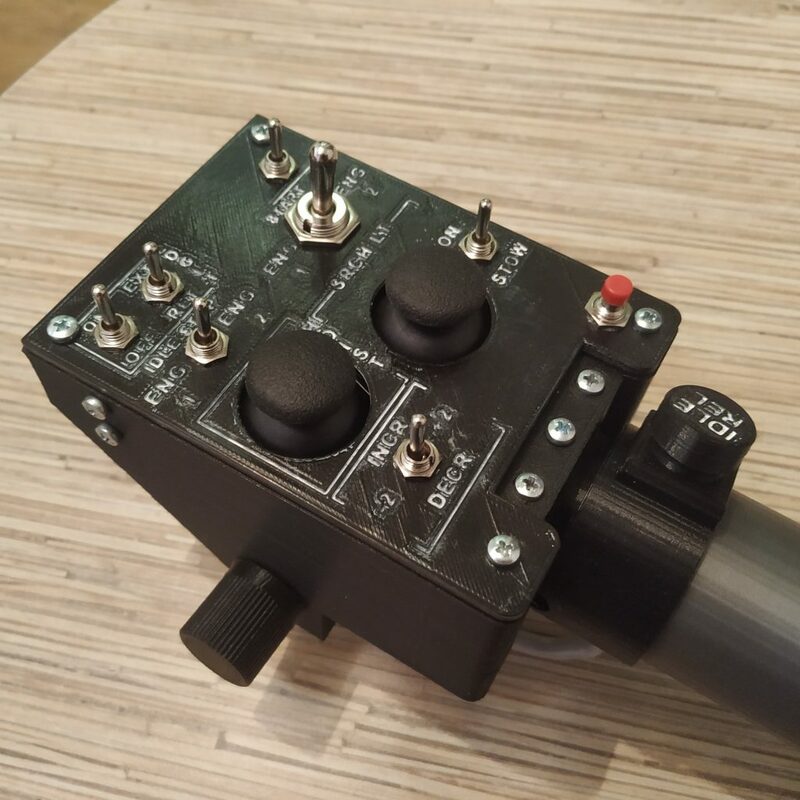 The helicopter community suffers in terms of affordable and realistic peripherals. Your work is truly a blessing to those who want to take the route of DIY but don’t know where to start. You provide all the necessary beginnings for us to truly make ourselves a quality experience. So thank you very much for that. 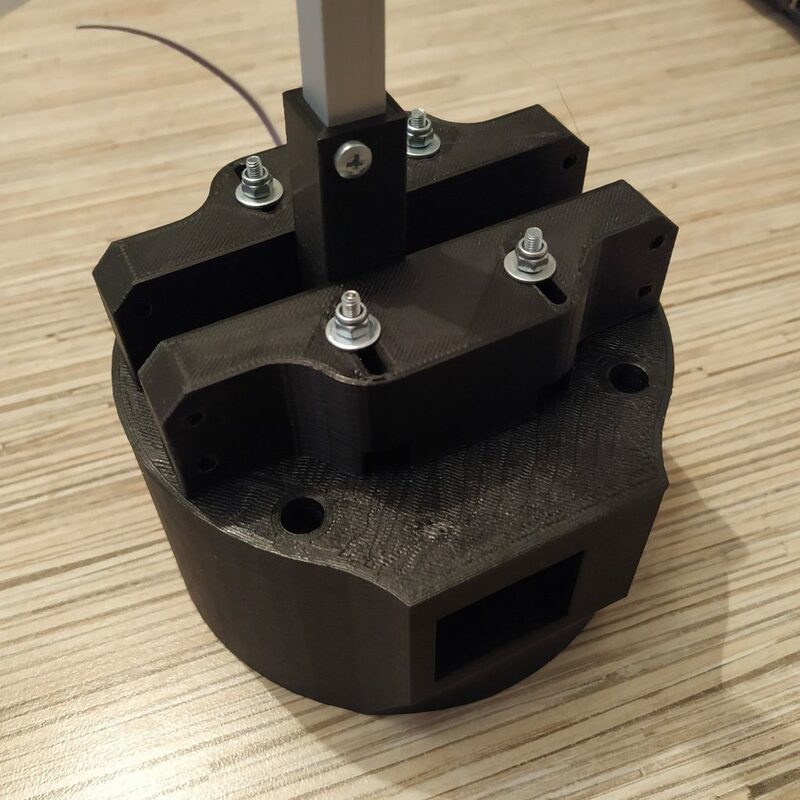 Regarding the printing, i see you use PLA and don’t recommend we use ABS to print with. How have your prints held up? My only concern about PLA is the possibility of it breaking down in just a year or two due to moisture changes in the air, and due to handling without gloves on for prolonged periods. Have you tried to use nylon or POM, or would that also mess with the print ? 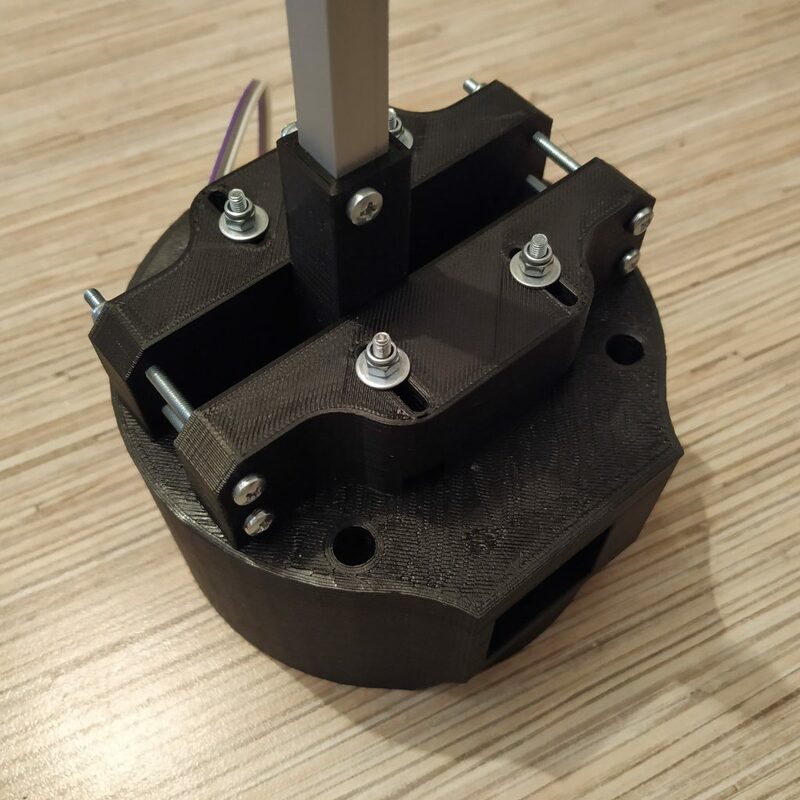 By my estimate you need a M4x100mm or M4x110 to connect the two halves of the throttle frame together. Hi Connor! Thank you for noticing that it’s not listed – fixed it! But you’re wrong about 110mm, you need exactly an M4x80mm screw. You have to press-fit a nut into the socket. Use something long, like a Phillips head screwdriver. Unfortunately that’s not the case, maybe something is wrong with the files I downloaded. 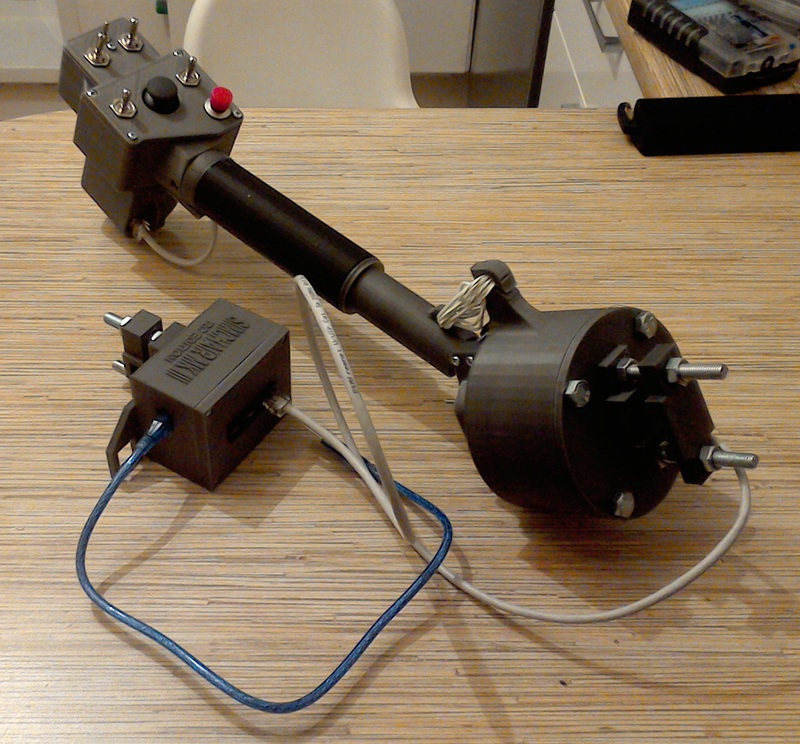 Check the image below of the 3d models for p1 and p2 of the throttle. The blue lines are where an 80mm long screw reaches to and the red is where it needs to reach to in order to even begin threading. Wow, looks like you’re right! Looks like an M4x110mm screw will be ideal. I wonder where the 80mm one appeared from then 😀 Thanks for pointing that out! Will fix.